At Disneyworld there are endless opportunities for fun. One things Disney does very well are scavenger hunts. In the middle of a busy day, be sure to take in all the details that fill the Disney parks. They are everywhere. Remy's Hide and Squeak at Epcot's Food and Wine Festival, Wilderness Explorers at Magic Kingdom, and Penny Press machines galore. The biggest scavenger at Walt Disney World are hidden Mickey's. Disney carefully hides Mickey's in attractions, rides, shows, resorts, atmosphere, and even Disney films. Hidden Mickeys can take on many different sizes and forms. 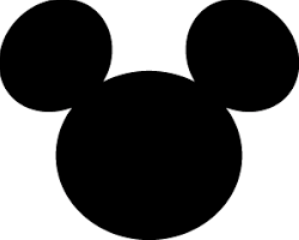 The most common hidden Mickey is a formation of three circles that may be perceived as the silhouette of the head and ears of Mickey Mouse, often referred to by Disney aficionados as a "Classic Mickey". Hidden Mickey's can be found in rocks, plates, decorations, paintings, anywhere. When not in the "Classic Mickey" shape, you can find them as a full body Mickey's as well. Many people think of hidden Mickey's as small and hard to find. Here is a list of 7 VERY LARGE Hidden Mickey's. Many of them can only be seen from the sky or on google maps. Disney Imagineers are always looking for ways to incorporate hidden Mickeys into new attractions or venues. It's safe to say this massive hidden Mickey was incorporated into the ride track by Disney imagineers. If you have ever been on Expedition Everest, you actually were riding a hidden Mickey! BONUS: Some say that when yo expand the aerial view of Expedition Everest you can see a hidden Oswald! What do you think? Close by Epcot is a massive solar panel farm called the "Walt Disney World Solar Facility"
Epcot area is a very fitting location for their solar farm. The Experimental Prototype of Tomorrow. On the Kilimangaro Safari ride, you will see one of the coolest hidden Mickey's. 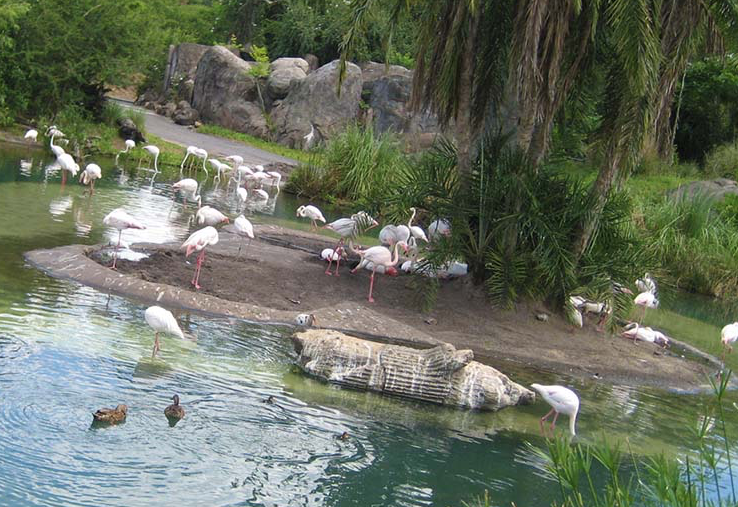 The flamingo island is a perfect Classic Mickey! ​There are actually quite a few Hidden Mickey's in Epcot's Living with the Land ride. 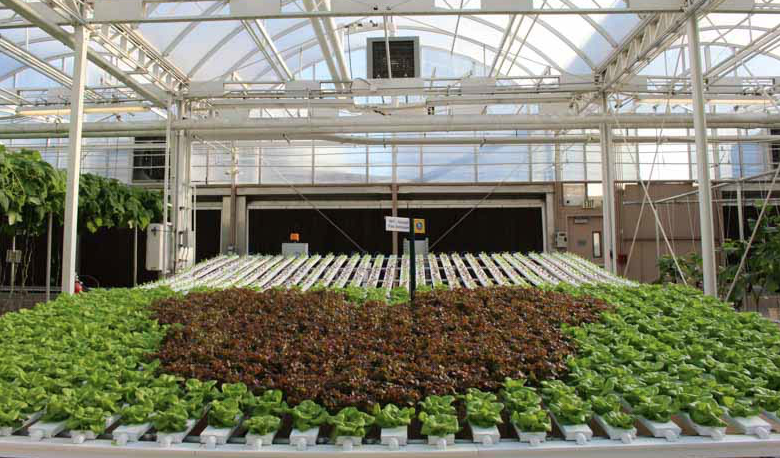 For instance, the agriculturists have fun creating interesting displays in the lettuce section. In the past, they had spelled out EPCOT in the lettuce. Can you spot Mickey? 3. The Seas with Nemo and Friend Pavilion. 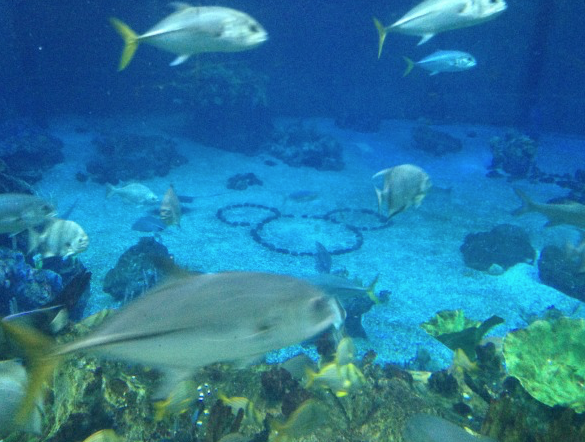 There are quite a few Hidden Mickey's at the Seas with Nemo and friends ride and pavilion. In an oyster, in the sand, on the walls... 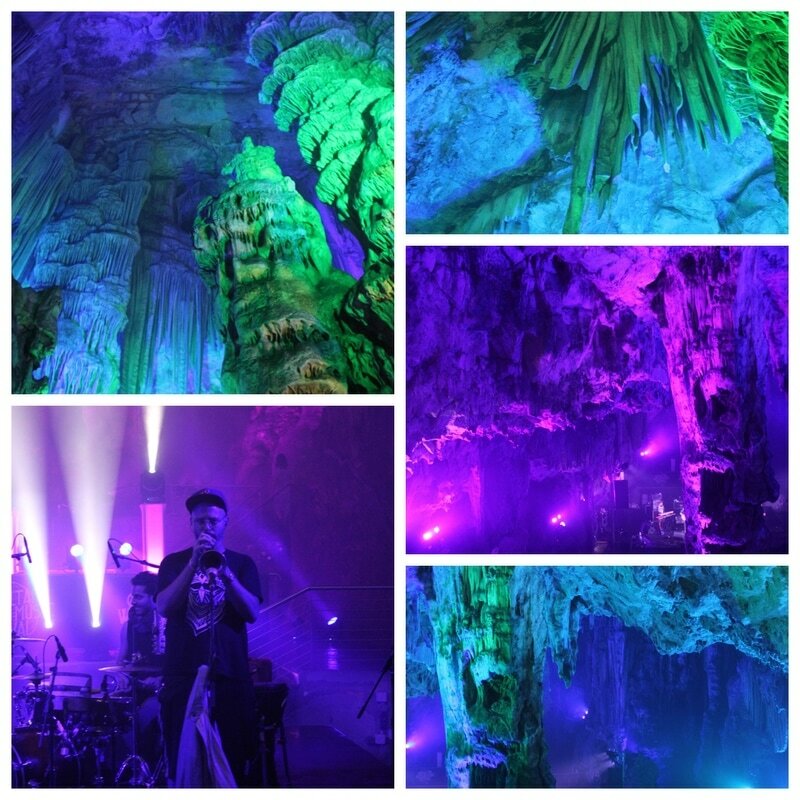 Since this Blog is about LARGE Hidden Mickey's, I am pointing out the rock formations inside the aquarium. Cast Members really have fun with this one. Sometimes it is Mickey and sometimes it is Goofy. Take a look when you are there. What will you find? 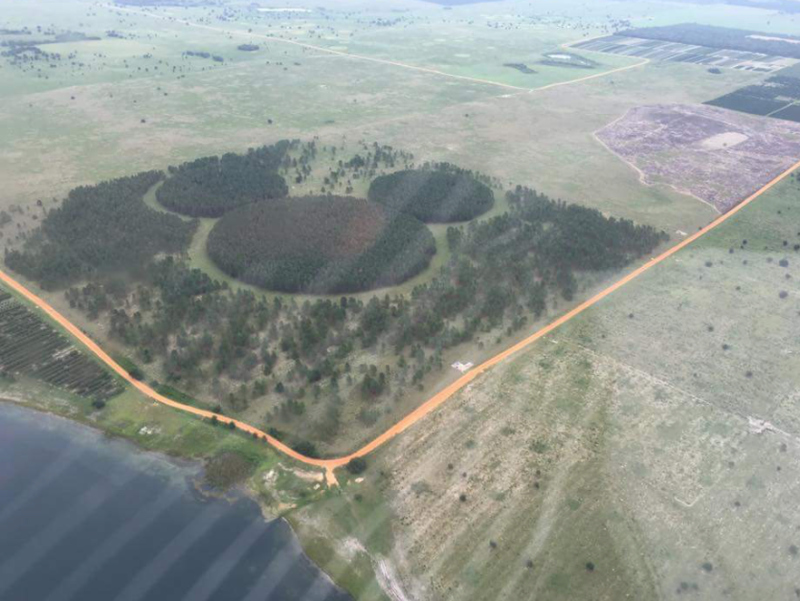 The Mickey Forest, 10 miles south of Clermont, is the start of a reforestation program in Lake and Orange counties by the Walt Disney Co. The land started as Orange groves but was killed due to the firsts in the 1980's. It was rebuilt in pine in 1992 in the shape of Classic Mickey. Many volunteers planted trees and they even had special guests show up like Chip and Dale! You can see this Mickey from some westbound flights out of Orlando that captains called the "Epcot Two" route. If you are able to get this flight, experience is that you’ll see Mickey’s Forest from the right-most window seat (typically, seat “F”). ​This is the worlds LARGEST HIDDEN MICKEY. ​This may not be the largest Hidden Mickey but in my opinion it is the coolest. Hollywood Studios park. YES you ready that right. The entire park is one big Hidden Mickey. 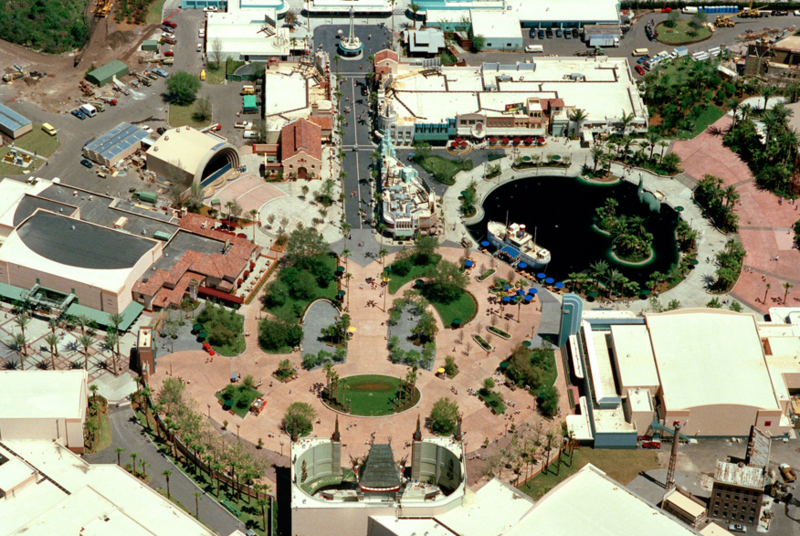 Next time you visit Hollywood Studios you may view the park a bit differently. Gibraltar is one of the most interesting places I have been to because it is a British Overseas Territory, on Spain's southern coast. You can drive to Gibraltar from Spain. To give you an idea, it is roughly an hour drive from Marbella. ​To cross the border from Spain to Gibraltar, you can drive a car or motorcycle, ride a bike, or walk. After doing research we learned that walking would be the quickest way. Driving, especially during rush hour can be backed up a few miles. If you decide to walk in, you can find parking in La Linea, Spain; which is the town that borders Gibraltar on the Spanish side. From there, you walk across. 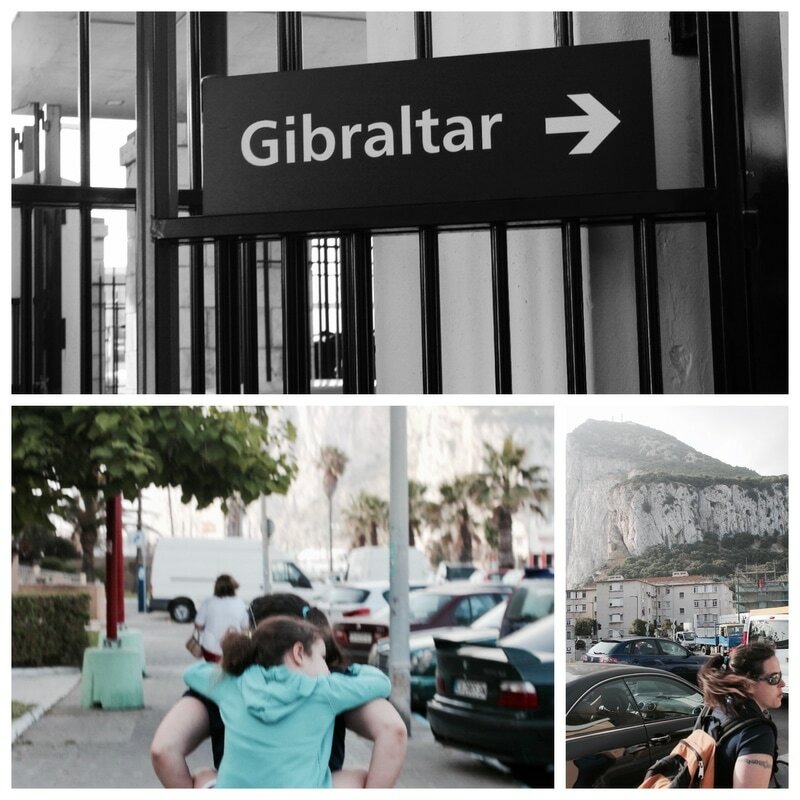 The walk took us about 10 minutes to get to the Bay of Gibraltar. To get to the rock from La Linea, it would take a little longer. 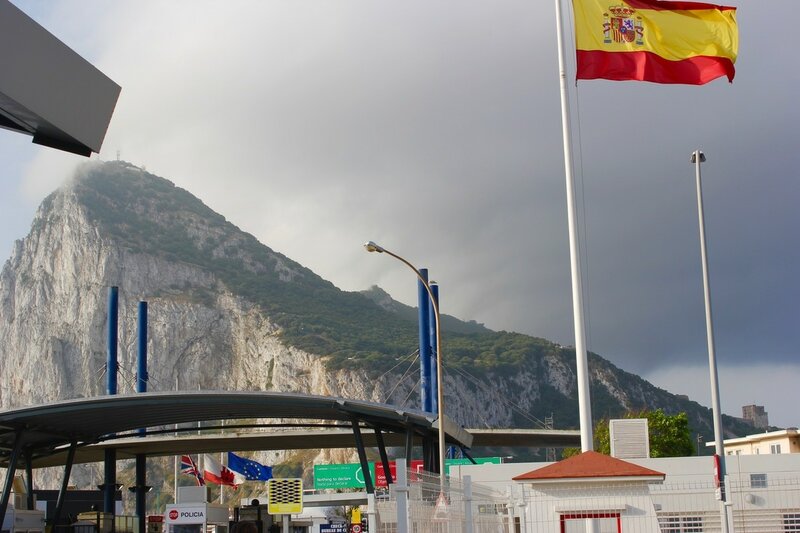 Since it is British territory, you must bring your passport to cross over into Gibraltar. I found it really cool that on one side of the border there was a Spanish flag, and on the other is the British Flag. 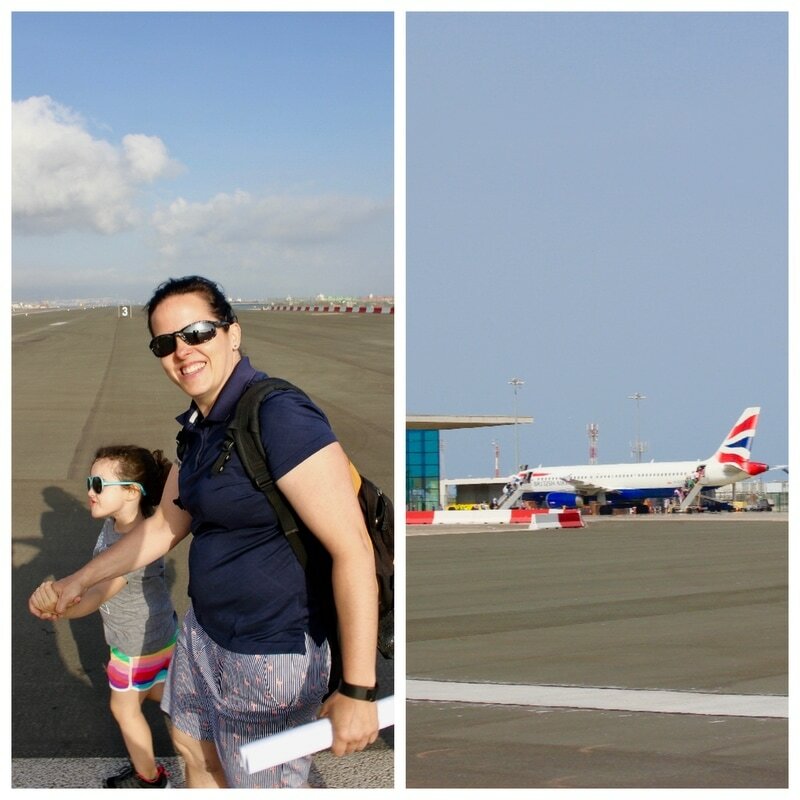 Once you get past security, you actually walk across the Airport runway, which is pretty cool. Of course once we entered British territory, we had to do all things British. 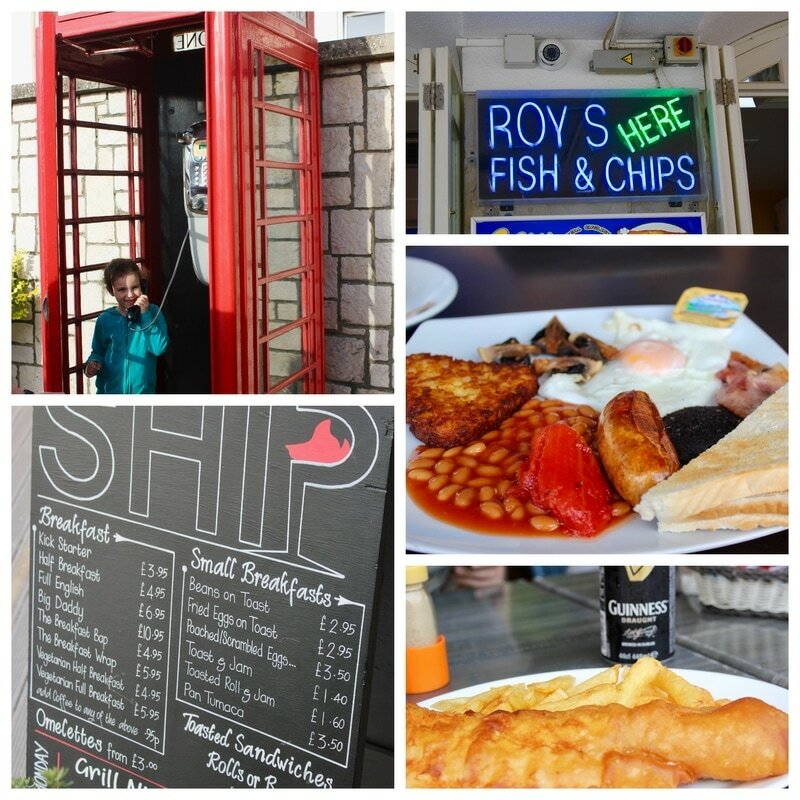 First stop was a phone booth for an obligatory photo, then to a traditional English breakfast, and later in the day we treated ourselves to the best Fish and Chips in Gibraltar, Roy's! And as you will notice, we have plenty of pictures of the British flag. After breakfast we went on a Dolphin sightseeing adventure. There are two big companies that do these tours. 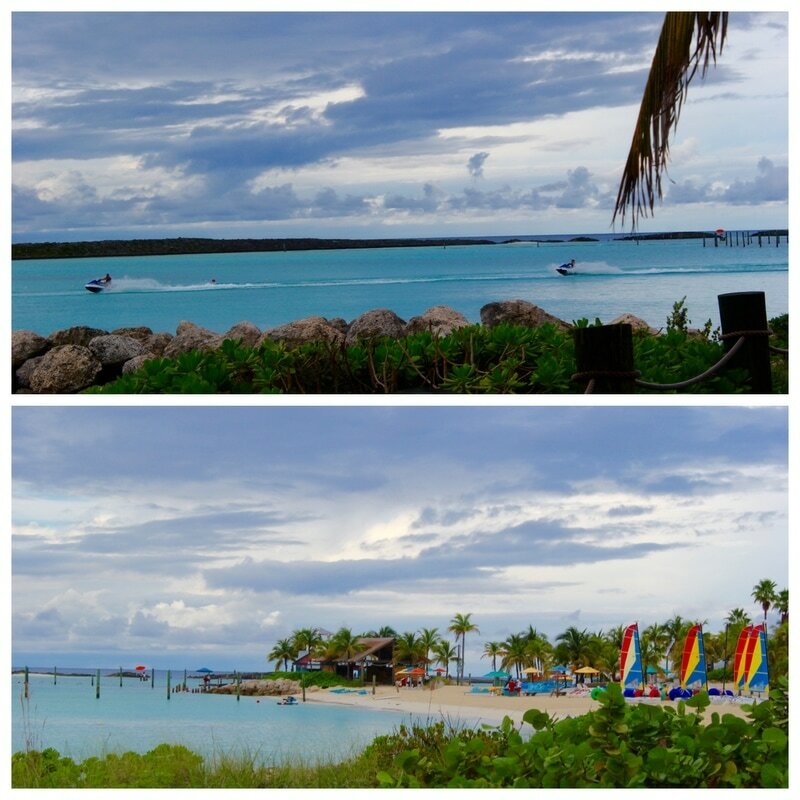 Dolphin Safari (blue boat) and Dolphin Adventures (yellow boat). Both have very positive reviews on Trip Advisor. Both leave from the same vicinity and go to the same parts of the ocean. 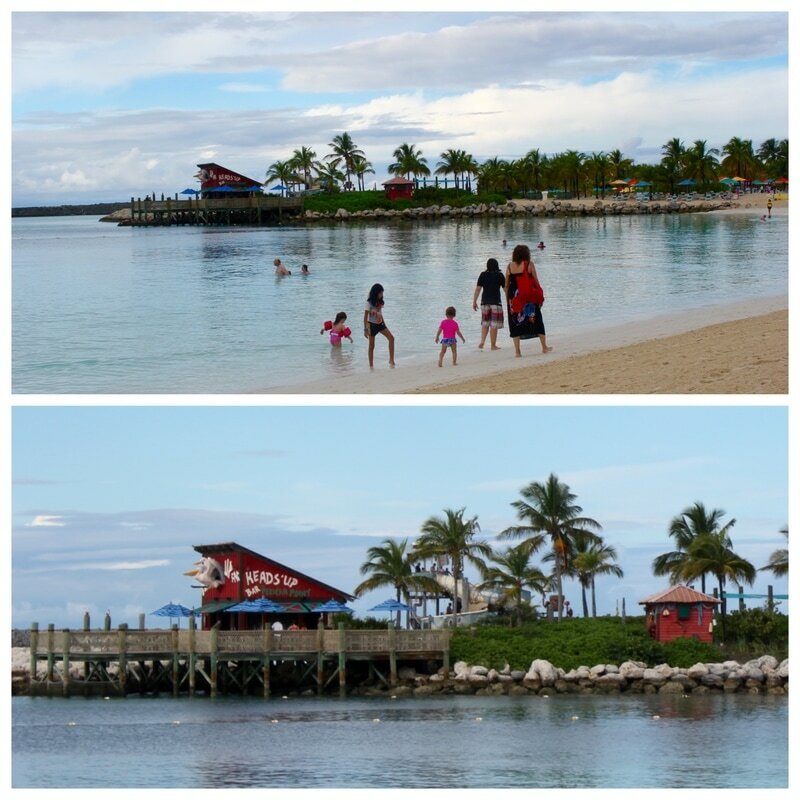 We chose the Dolphin Safari for our tour and it was excellent. I would strongly recommend doing a Dolphin excursion and I don't think you could go wrong with either company. When you first leave the port, it is very scenic. The Rock of Gibraltar sits behind the Bay, and the Airport is to the right. It is really cool if you are able to witness an airplane taking off or landing. The straight of Gibraltar connects the Atlantic Ocean to the Mediterranean Sea and separates Spain in Europe from Morocco in Africa. Gibraltar is in the middle. The environment in these water make it the best place to see whales and dolphins in all of Europe. You generally will only see one or the other. Not both. The straight of Gibraltar has 3 species of dolphins (common; which is endangered, Striped, and Bottlenose; which is the most popular) and 4 species of whales (Long-Finned, Orca, Sperm, and Fin). When we were there we only saw dolphins, but we saw a lot. They were everywhere. We didn't see them right away, however one of the crew members had binoculars to spot movement. 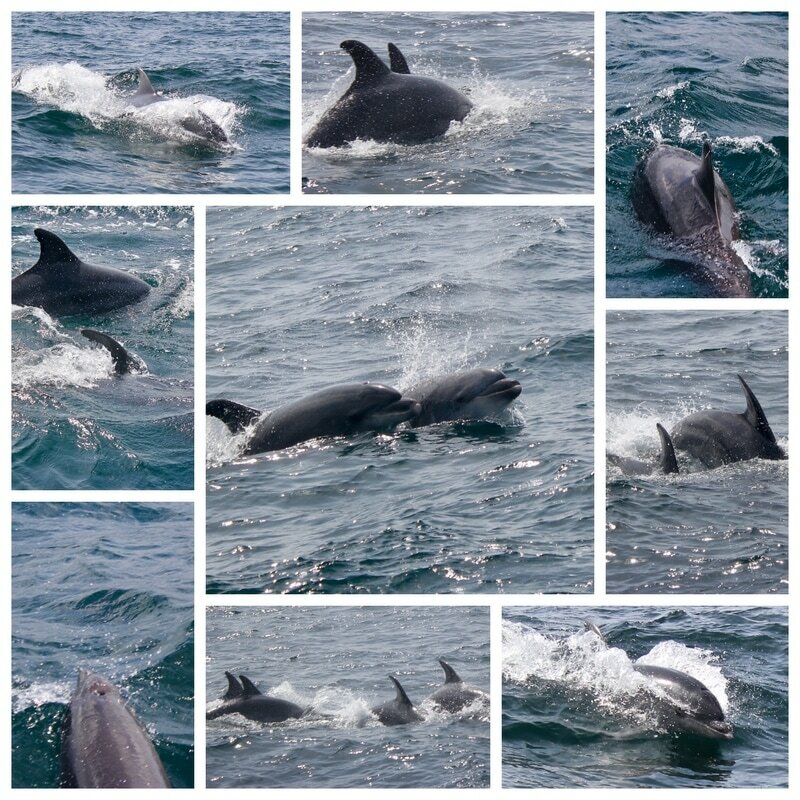 Once we found them, there were plenty of Dolphins, and at some points they were right beside our boat. Incredible. Before you the leave the bay, walk around for a bit. There is a very cool hotel that used to be a cruise ship called the Sanborn. You can go into the hotel and go to the top floor for a view of the bay. The entrance is on the left side of the ship. There are also some restaurants and bars you can enjoy, and scenic boats. 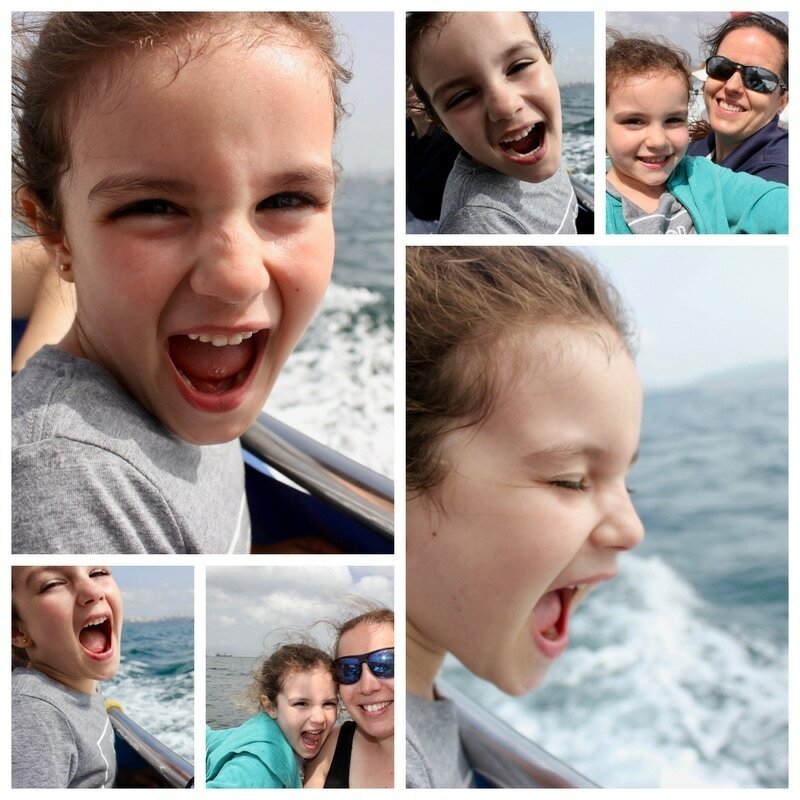 My daughter enjoyed taking pictures as well. 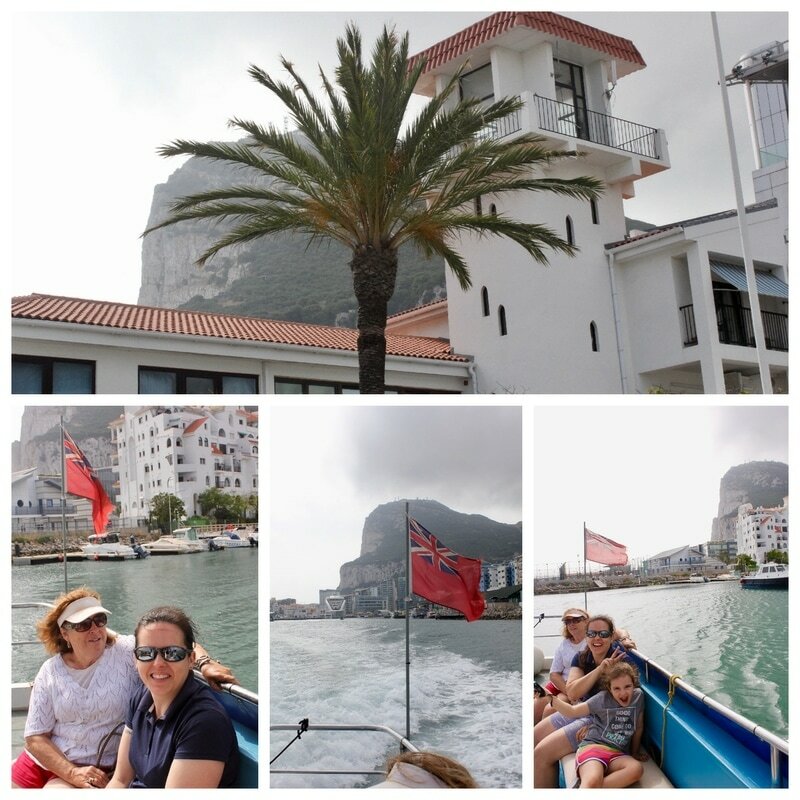 After the dolphin excursion it was time to go up the "Rock of Gibraltar". The rock is without doubt what you think of when Gibraltar is mentioned. There are a few ways to go up the rock. You can hike, drive, take the cable car, or take a tour. 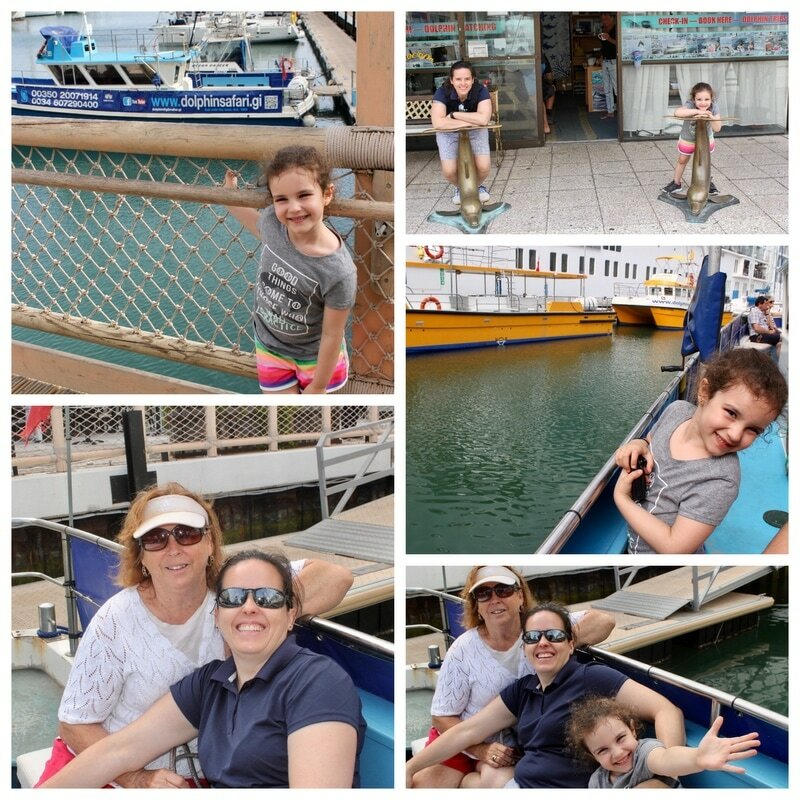 We booked a tour that included both the dolphin excursion and visiting the rock. Each can be purchased on their own as well, since they are with different companies. The reason we chose the bus tour up the rock was because we only had a day in Gibraltar, and we were with our parents, including my father in law who has mobility issues. Hiking was not an option, and he wanted to see the sights. In future, I would chose to hike up and see the rock on my own, or take the cable car, which is incredible. The tour was very rushed and I would have liked more time at each stop. However, we were able to see most of the sights and our guide was full of great information. Would I do the bus tour again? No. Was it good for what we needed while we were there? Yes. Europa point: The southern most point in Europe. On a clear day you can see both the coast of Spain and Africa, while you are in Great Britain, Pretty rad. There is a lighthouse here, not pictured. Great Siege Tunnel: We only drove by this. I was very disappointed we didn't stop. I think the tour normally stops here so you can go inside, however we were running a bit late and many of the people on our bus had to get back to their original tour bus that brought them to Gibraltar for the day. Apes den: This is just an area the monkeys hang out. In all honesty, if you are able to hike up the mountain, you will likely see apes most of the way. Seeing them in their natural habitat like this would be the best experience. In a tour you see them in their natural habits because they live on the mountain, but there are so many people around, it doesn't feel natural. Hiking will give you a better experience, if you are able. Taking the Mediterranean steps is the best route. Otherwise I would recommend taking the cable car. You will still be able to roam the rock on your own once you get to the top. The monkeys on the rock are called Barbary macaques. They are the only wild monkey population in Europe and originated in North Africa. 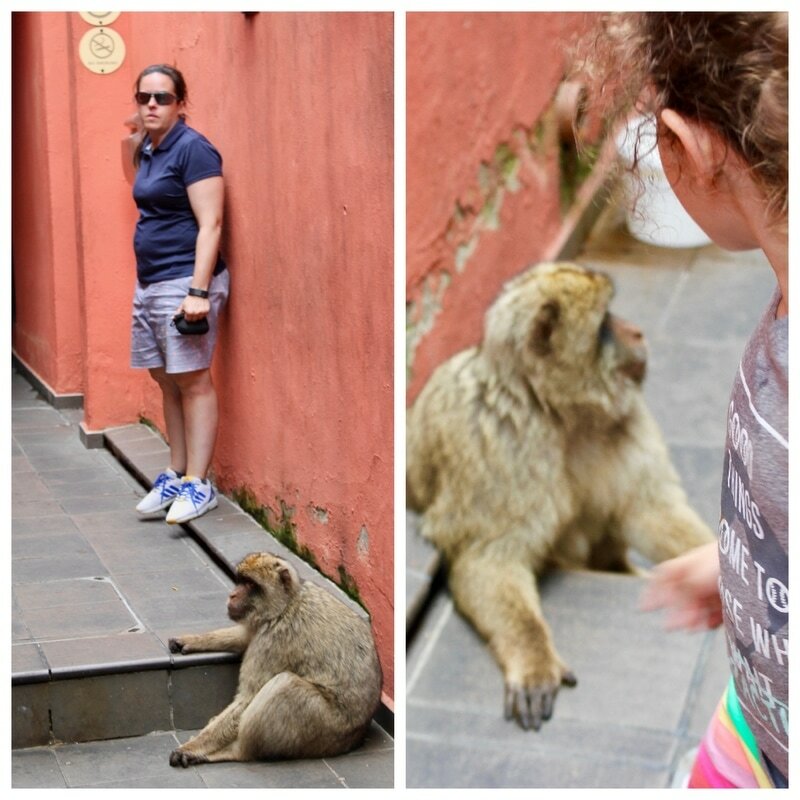 These wild monkeys are now a huge part of Gibraltars tourism. They are used to being around humans and will occasionally climb or jump on people. It is strongly discouraged to try to touch them and never feed them. In fact, try not to keep snacks in your backpack as they are skillful at opening zippers and will rummage through bags looking for food. This can also cause aggressive behavior. 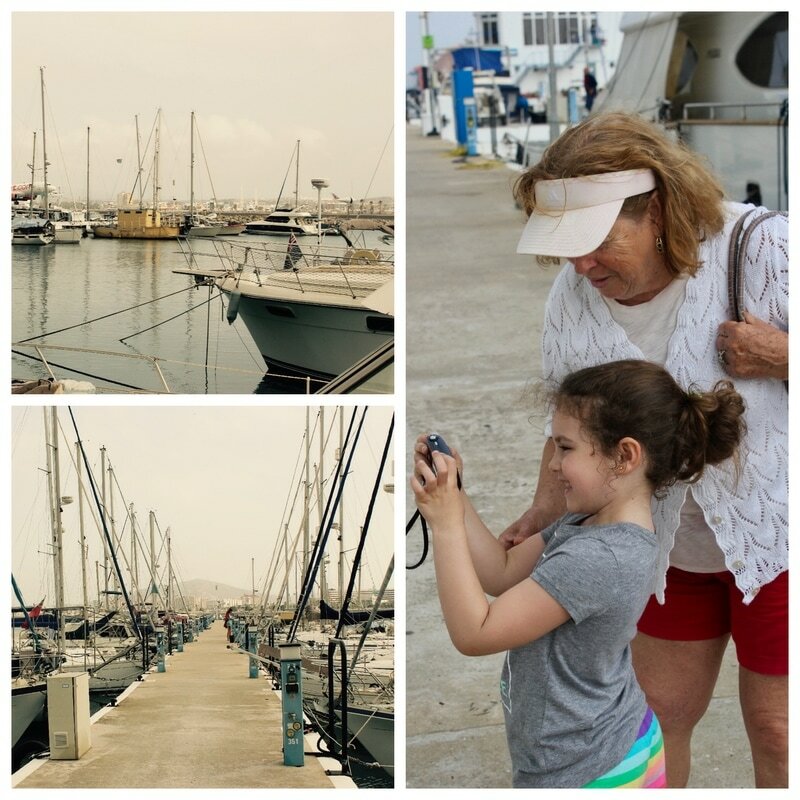 Gibraltar has plenty of activities to keep you busy for a day or even over night. There is plenty of shopping and it is duty free so you can get cigarettes and alcohol a bit cheaper if that is your thing. Also, the World War II tunnels are amazing. 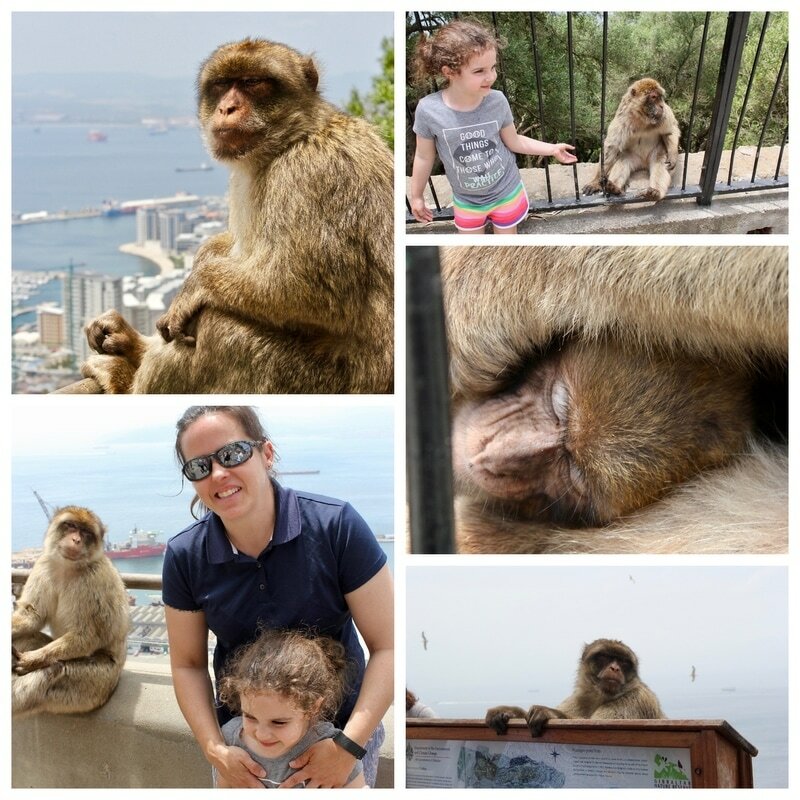 We did not tour them but we plan to next time we visit Gibraltar. The WWII tunnels are not the same as the Great Siege Tunnels. Entrance is by tour only. The tunnels were an underground city during the war. The entire 16,000-strong troops could be housed there, along with enough food to last them for 16 months. The tunnels also contained a telephone exchange, a power generating station, a water distillation plant, a hospital, a bakery, ammunition magazines and a vehicle maintenance workshop. The total length of the entire tunnel inside the Rock is approximately 34 miles. If you plan to visit and explore without a scheduled tour, purchase your tickets prior to going up the rock for any attractions you might want to visit. They require tickets and you cannot get them on the rock. ​Thanks for visiting and leave comments below! Ronda is a mountain top city in the province of Malaga Spain with the Sierra Nevada mountains. Ronda had been described by Ernest Hemingway as the most romantic place in the world. He loved Ronda so much that he used it as a setting for many of his books. “Ronda is the place where to gso, if you are planning to travel to Spain for a honeymoon or for being with a girlfriend. The whole city and its surroundings are a romantic set. 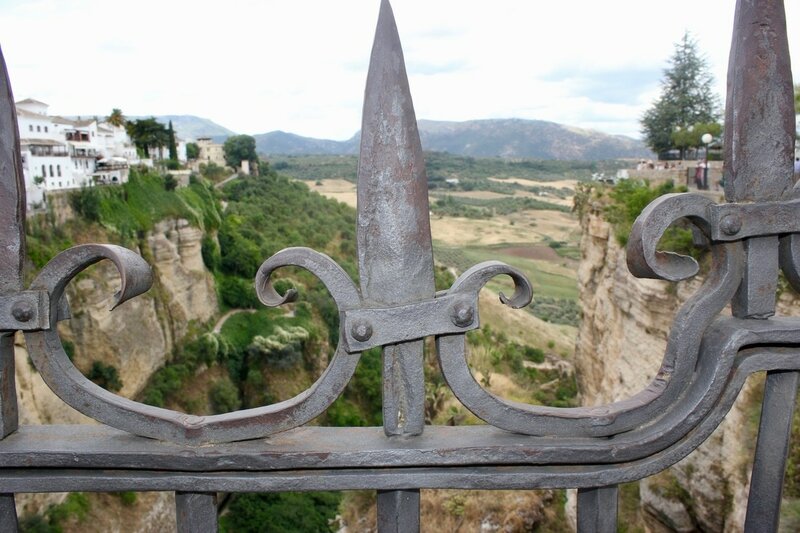 The beauty surrounding Ronda with literally take your breath away. Ronda (Acinipo) was first declared a city by Julius Caesar in the late 4C AD. When the Moorish troops under the command of Tarik-ibn-Zeyad invaded the region, one of the first routes they followed was the old Roman one, linking Gibraltar with the Roman settlement of Acinipo. They renamed the town to Izna-Rand-Onda - Ronda. The ruins of Acinipo actually sit about 20km outside of Ronda. 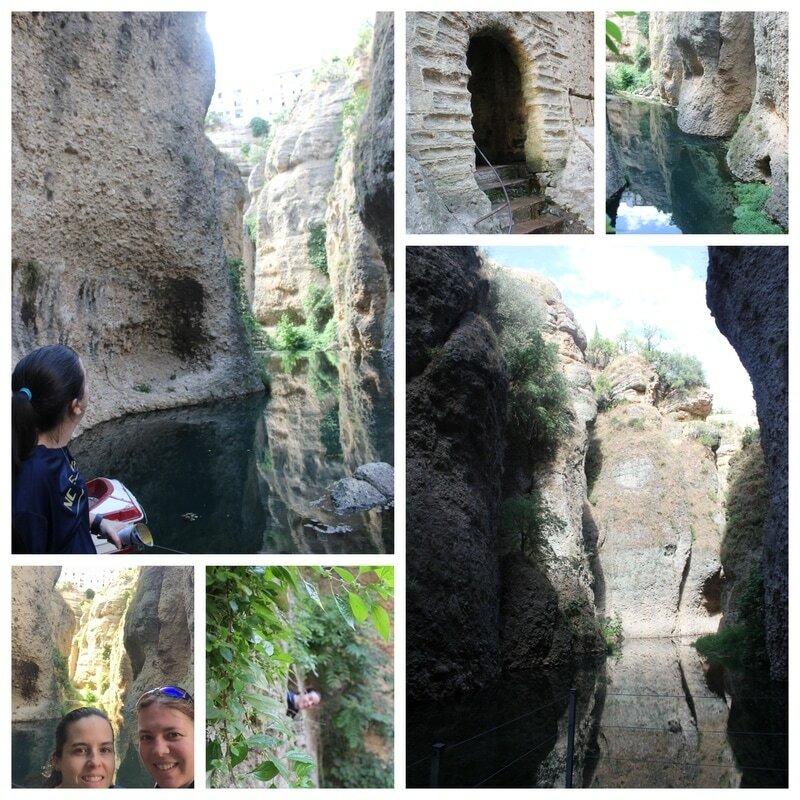 If you would like to visit them take the A-376 towards Sevilla, and after 7km turn right onto MA-7402 Acinipo and Ronda la Vieja. 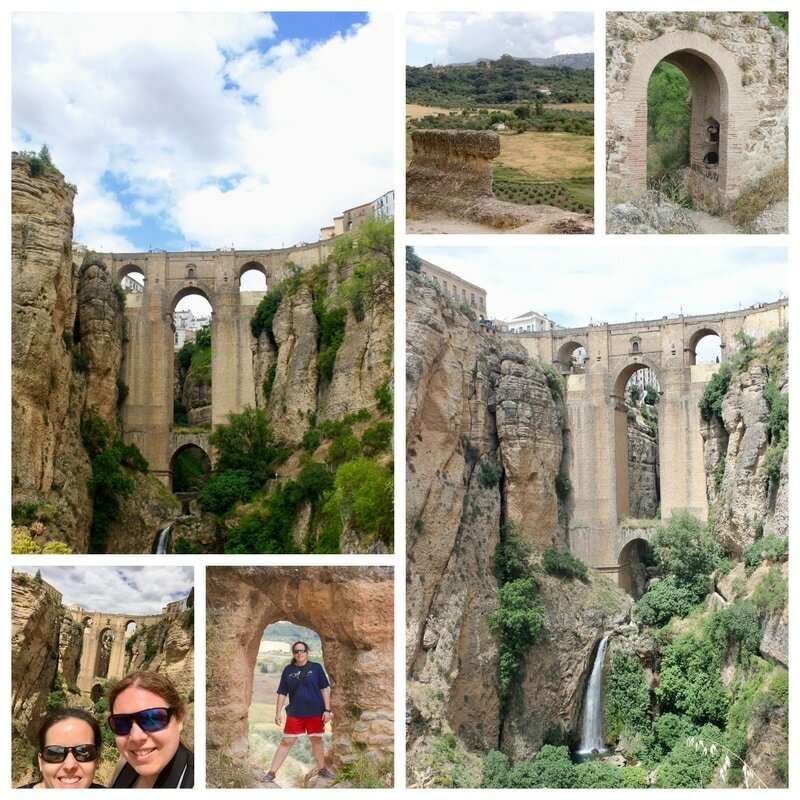 ​Without a doubt the most famous of all sites in Ronda, and one of the first things you will see when you arrive is the Puento Nuevo, "New Bridge." 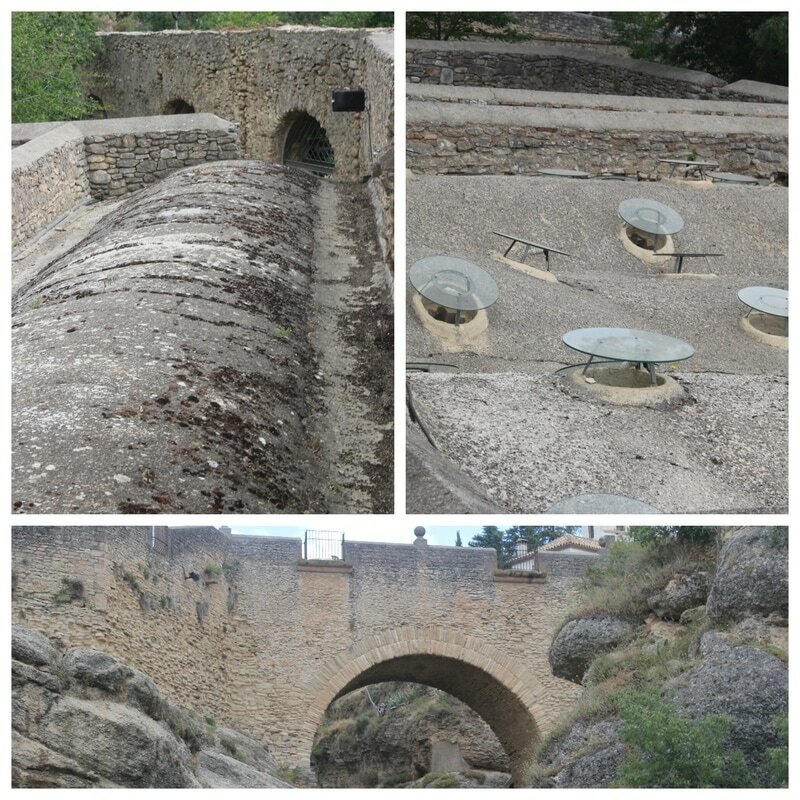 This bridge joins the old Moorish town and the new town. Looking out from the bridge offers the most stunning views of the El Tajo Gorge. In the photograph of the bridge above, you will notice a building. That building is the Parador Hotel. 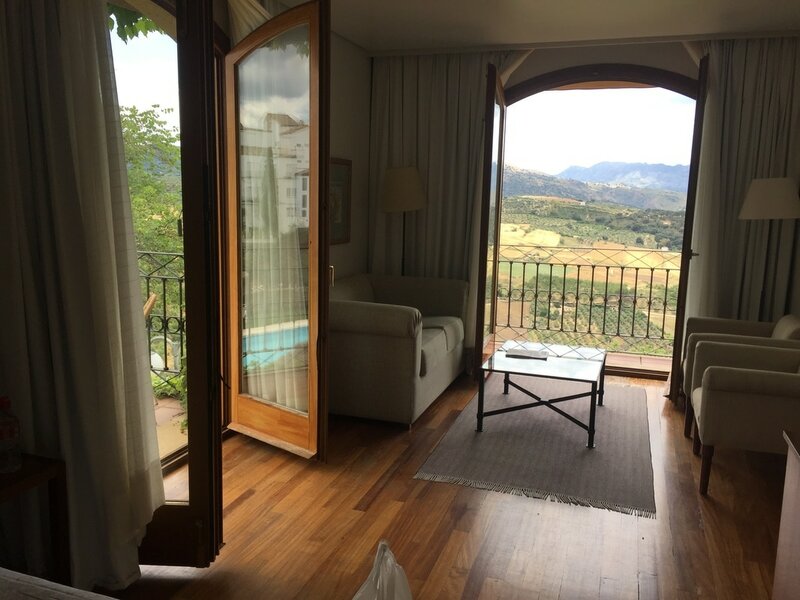 If you are going to spend night in Ronda, this is the place to stay. 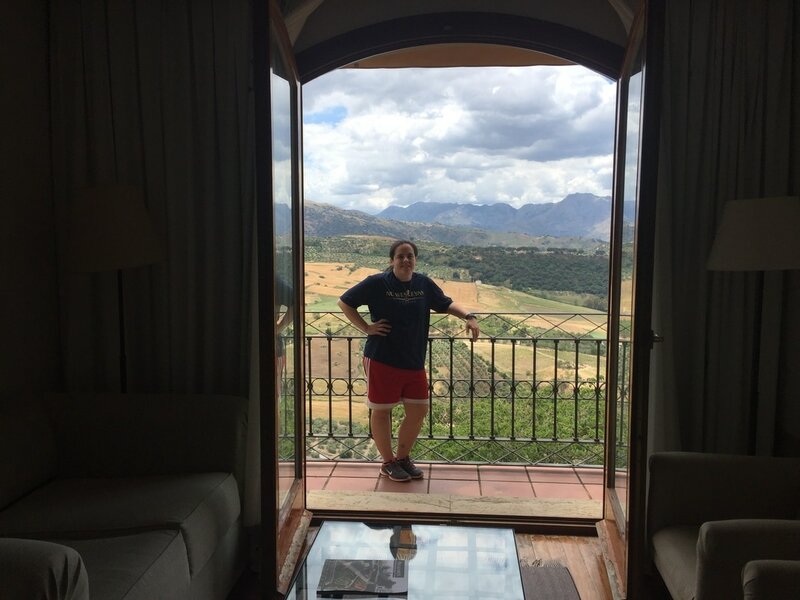 The parador offer the best views in all of Ronda. Each room has a balcony, and breakfast is included. If you can, stay in room 119, 219, 0r 319. These are the corner rooms and you will have two balconies. Trust me, when it is time for the sunset you will not regret your decision. If you would like to capture your own photograph like the ones below, you must put on some good shoes and do a little hiking. It is not too bad, and can be done in about an hour, depending on how much you want to explore. There are some ruins you will see as well. Arab baths in Ronda are located in old town Ronda. 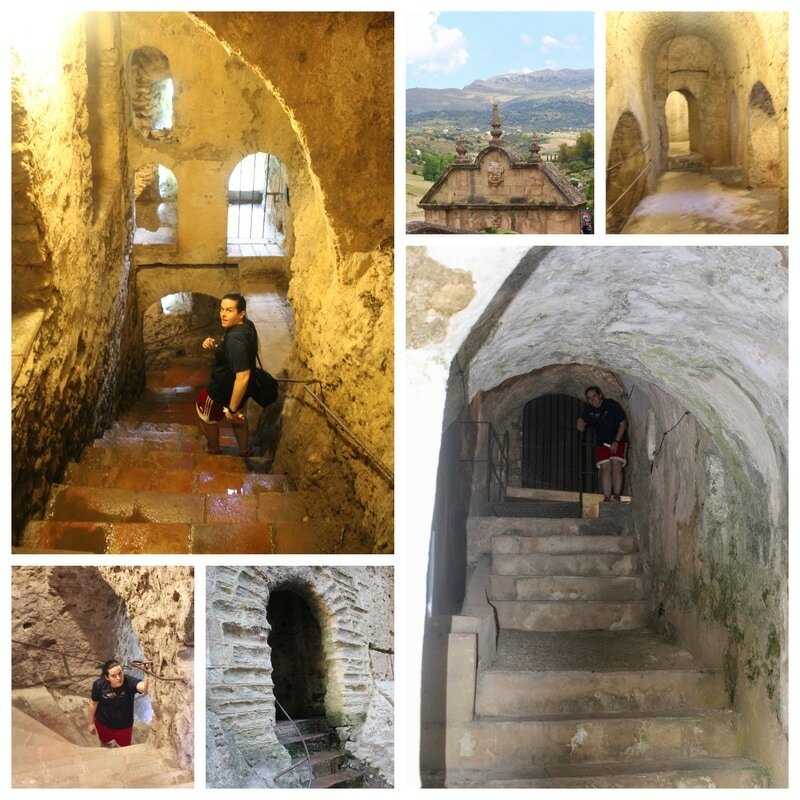 In Moorish times the main entrance to the Medina of Ronda was located next to the Baños Arabes. In those times the baths were outside the walls of the city, and set to the side of the main entrance gate, with a small doorway built into the city walls that connected to a passageway leading to the entrance of the baths. 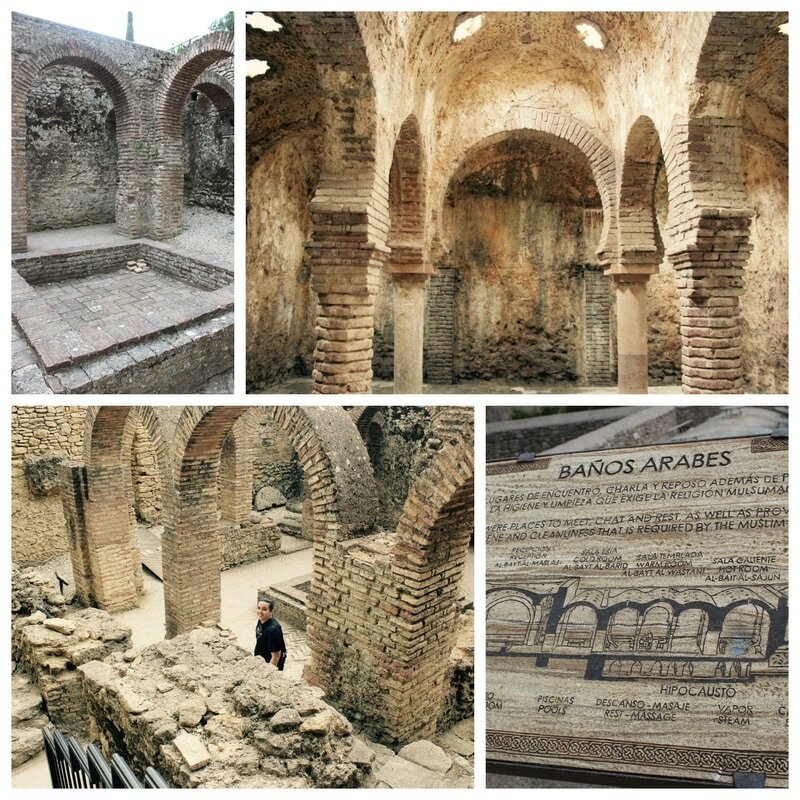 ​The baths were used as a daily social gathering by Muslim men. A Mosque was located next to the baths. Visitors would purify and cleanse their bodies and souls. Locals and visitors alike would stop in the baths before going to the Mosque to pray. Visitors would spend several hours here; cleansing the body several times over. 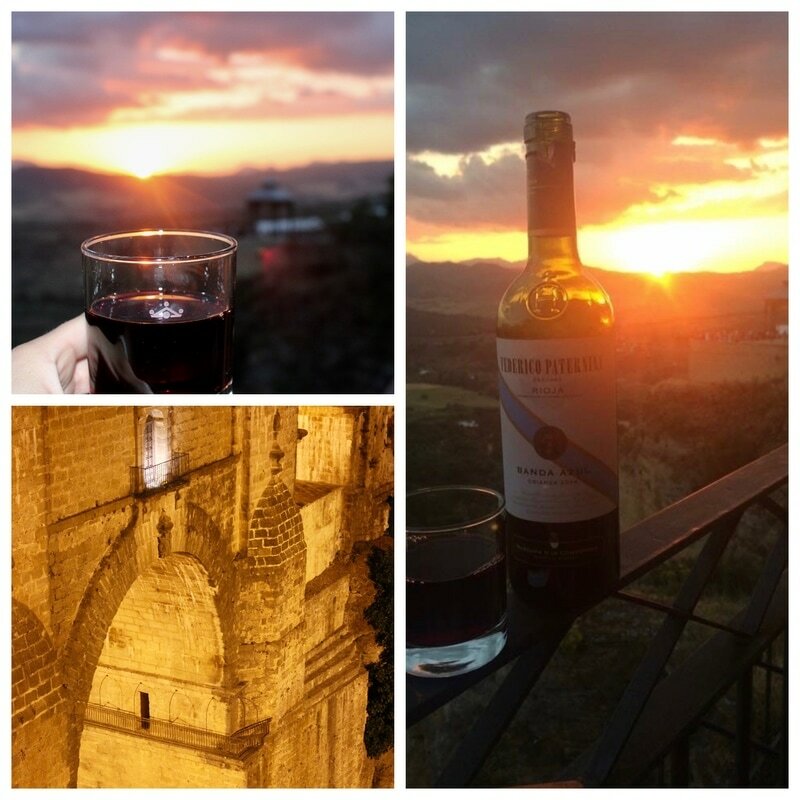 It was medieval Ronda’s equivalent of our nightly unwinding ritual of watching television. As you approach the baths, you will first notice the roof of Arab Baths. The glass circles on top are the skylights, and the glass protects the chambers below from rain damage. ​The first section of the baths has no roof anymore. This section used to be the reception area and changing room. In the reception there were benches for socializing and bathrooms as well. Beside the first ruined chamber is a doorway which leads into a small room with pools at each end. This was the cold room where people could relax and cool down before entering the warm and hot rooms again. The next room the largest of the covered chambers, the warm room where people could relax and enjoy a massage, be pampered with perfumes, or sit in a pool of slightly warm water. This room was warm but not steamy. Mats and cushions were available to use, as well as wooden benches around the walls, and several tables for massage and therapeutic treatments by trained slaves were situated next to some of the columns. Then there is the hot room, which currently has a presentation on screen for visitors to watch and learn about the baths. This room has a pool at one end where water from the aqueduct was splashed over the hot floor creating a very humid and steamy atmosphere in the room. Kind of like a modern day sauna. The fire room was next- this is where all the heat for the baths was generated and tunnels built into the structure allowed for the heat to move and warm the different chambers to different levels. You can visit the baths in about 30 minutes. It really is a quick in and out but you shouldn't miss this. The mine was built in the 14th century and was hidden in the House of the Morrish King. The mine was built to protect water supplies. With the mine, it was not necessary to leave the palace to collect water. They used a water wheel with buckets and slaves would form a human chain to pass water from below, up to the palace. The entrance to the mine is through the garden where you will start a trek down 231 steps and 60 meters below, that lead to the river. ​Because it is a mine, the stairs are a bit wet in some places. Wear shoes that you don't mind getting wet, but are also supportive and not too slippery. Along the way down there are cut outs that offer cool view points. The real treat is when you get to the bottom. You step out of the mine and are in the middle of the gorge. The only way to see this viewpoint is through the mine. The mine was also considered a secret escape because the location of the fortress cannot be seen from the Arab Bridge, which at one time was the entrance to the city. Directly above the fortress, is the Terrace of the Conquest, where Moorish and then Christian conquerers could watch the river for signs of attack. It is below the hermit’s grotto, and is so well hidden it cannot be seen from any direction. 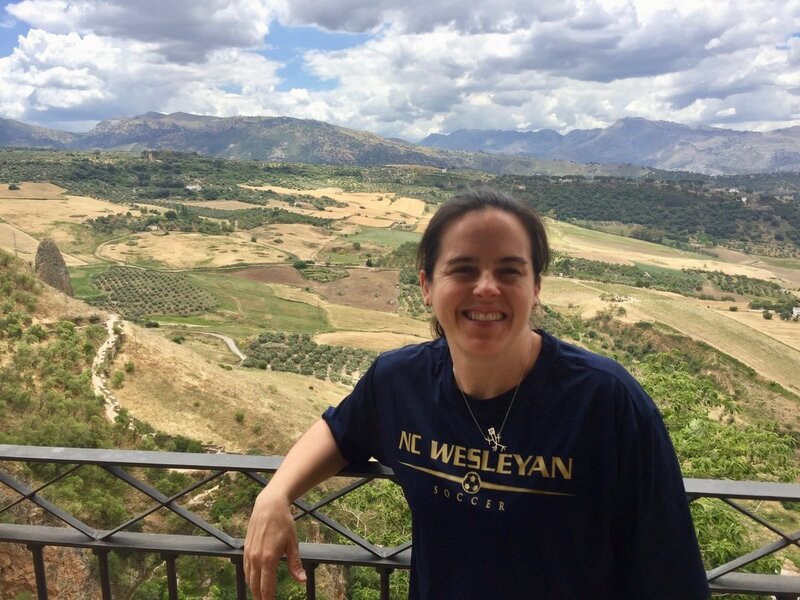 Ronda has a feeling of quiet exhilaration. If you like adventure there is plenty here. You can spend hours hiking and exploring ruins. 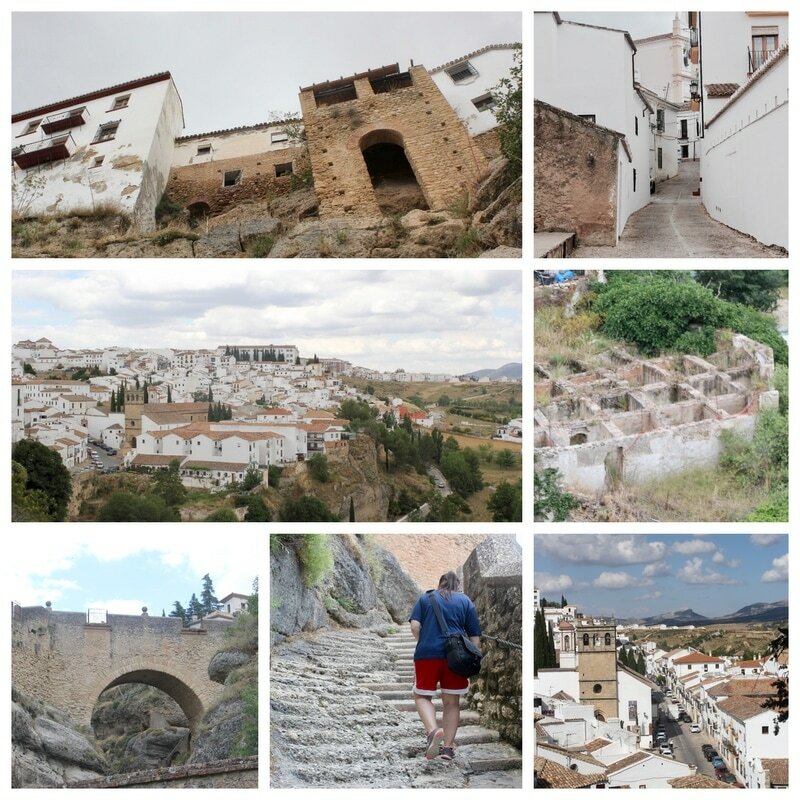 If that doesn't sound like fun, Ronda is kind of a sleep town where you can walk at a slow pace and enjoy the brilliant scenery which surrounds Ronda. Thank you for reading. Please post comments below. If you would like more information contact me at amara@enchantedmem.com or for a free quote visit www.enchantedmem.com. 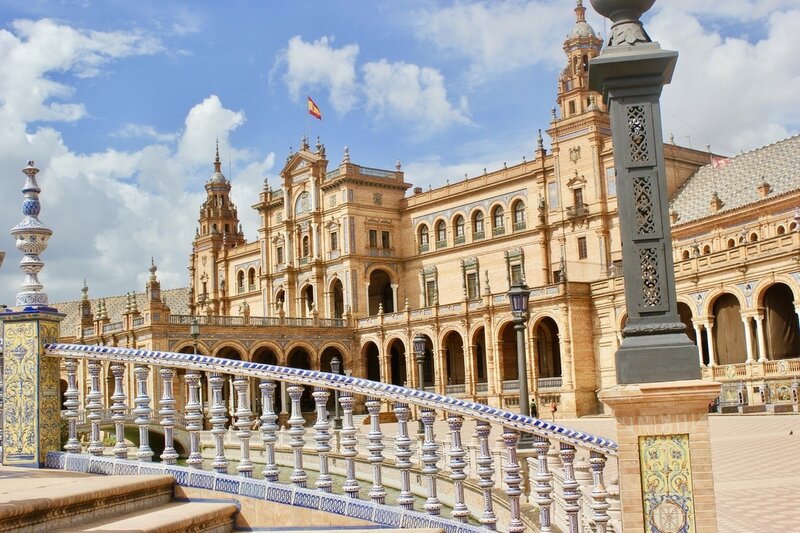 Seville is the largest city in Andalucia and one of the most visited cities in all of Spain. It is full of culture, beauty and energy. 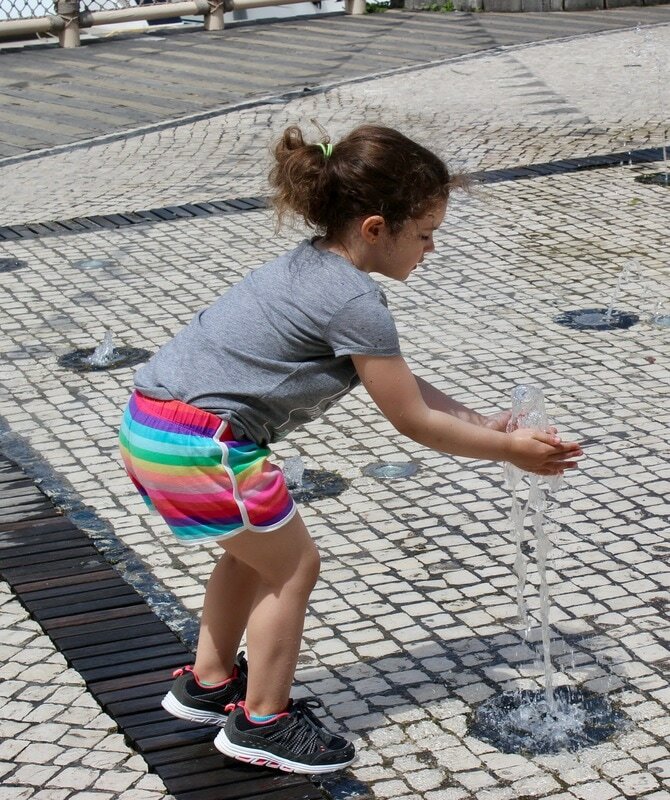 Be prepared with water and sunscreen because Seville is one of the hottest cities as well. 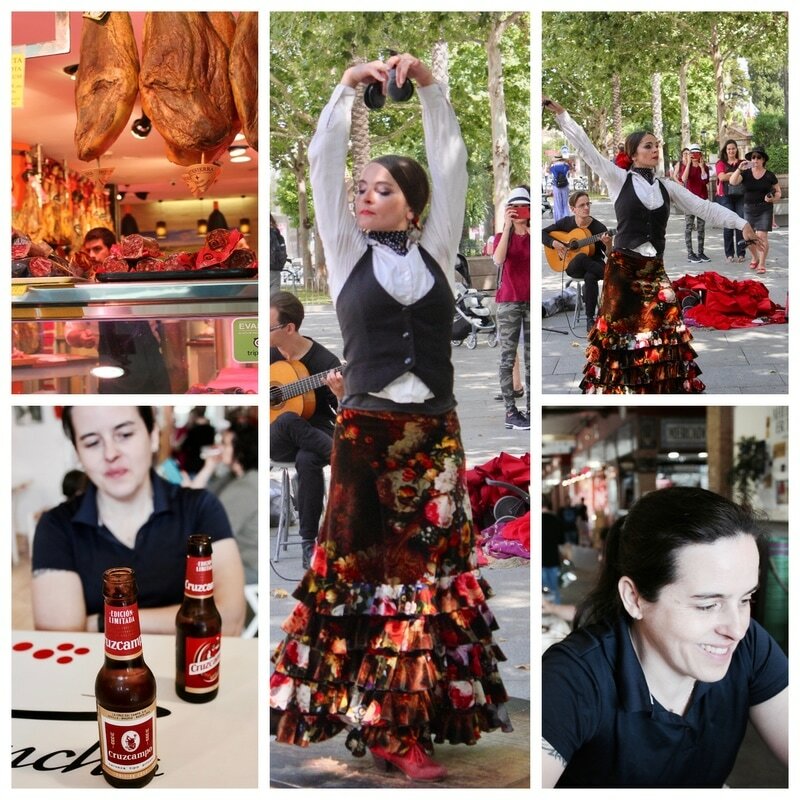 Walking through the streets you will pass orange trees, lively tapas bars, horse drawn carriages and flamenco dancers. Seville is a hotspot in Spain for both Flamenco and Tapas. 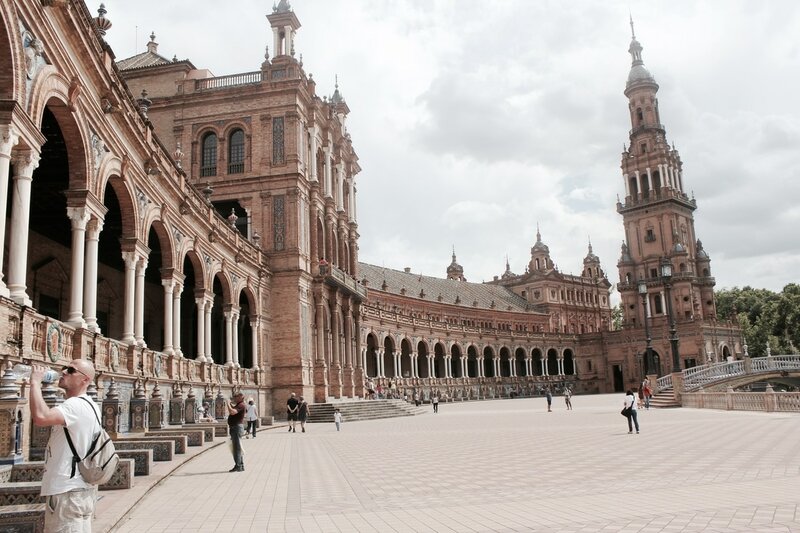 In addition to the fun and nightlife, Seville also boasts an incredible Cathedral, Palace, and other worthy sites. 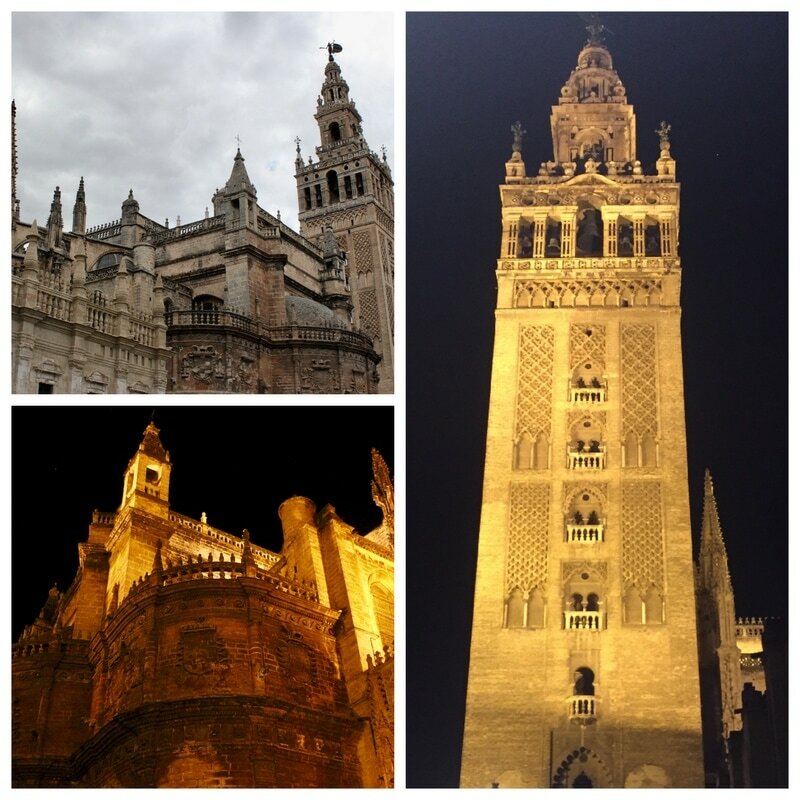 You can see the main sites in Seville in one day but a few nights are recommended to immerse yourself in the culture. 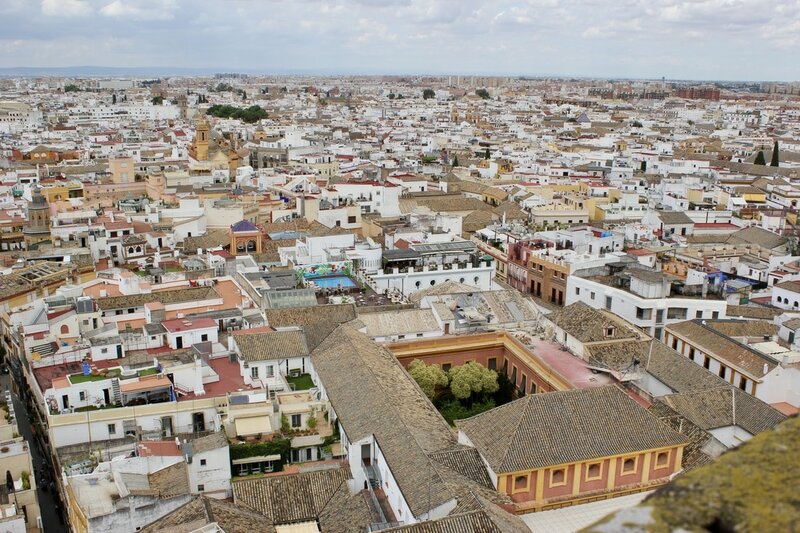 Seville is a very large city with 4 main neighborhoods. Centro Historic: This is the central part of town, the heart of Sevilla, and host to most of the must see attractions. This is where you will spend most of your time and a great place to stay. There are many great restaurants in this area, but there are also many tourists traps that will be more expensive. ​La Macarena: This neighborhood covers the north--eastern old city with Moorish city walls. It was once a slum, but now has many interesting Plaza's, churches , art galleries, and artisan food shops. Triana: Triana is located on the left side of the Guadalquivir River. It is connected to the city by the famous bridge, Isabel II. This Bridge once was filled with locks representing love, but they have been removed. Triana is filled with culture and character. It was one known for it's Gypsies but is now famous for it's Flamenco culture. Sevilla is an easy city to walk around. Many of the main attractions are within walking distance of Sevilla Centro. Seville's Cathedral is the largest Gothic cathedral in the world, and is a UNESCO World Heritage site. The cathedral took over 100 years to build, has 80 chapels and is 124,000 square feet. The cathedral used to be Seville's main Mosque but most of it was destroyed in an earthquake. In 1248 the new construction as the cathedral started, but two parts of the mosque were preserved: the Moorish entrance, and the Geralda Bell Tower. 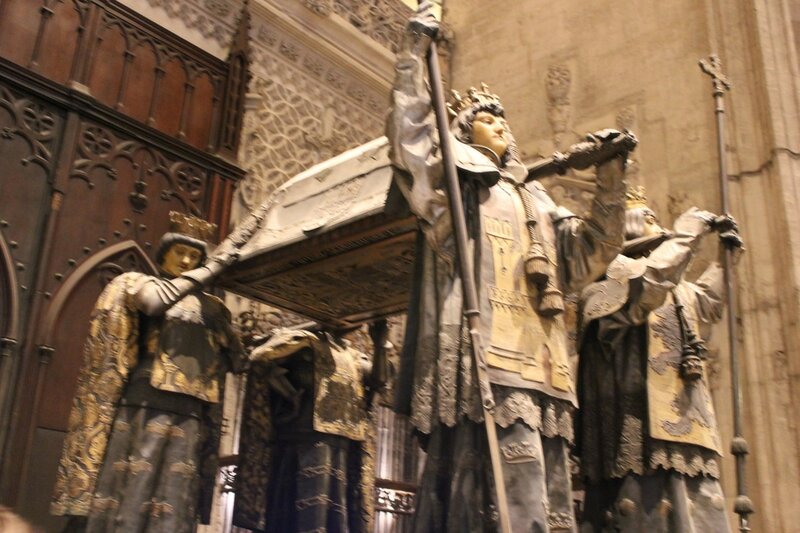 Admission includes entrance to the cathedral, where you can visit the tomb of Christopher Columbus, as well as admission to the Geralda Tower. 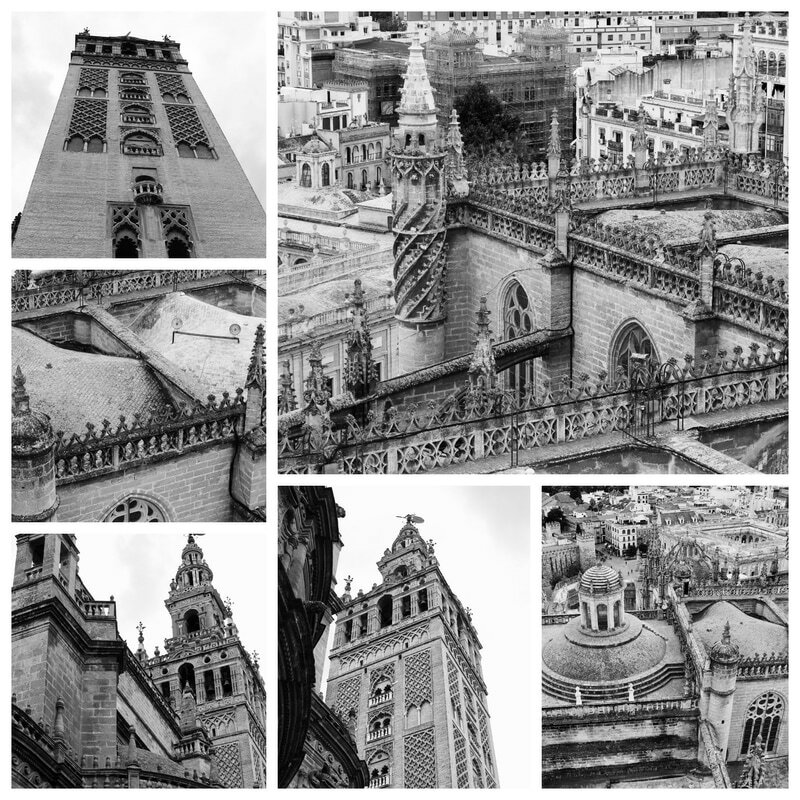 The tower is 36 floors high and you can climb the ramps to get a beautiful view of Sevilla. This is one of the most impressive sites in all of Spain and is recognized as a UNESCO World Heritage site. The upper levels of the Alcázar are still used by the royal family as the official Seville residence, making it the oldest palace in Spain, still in use. You may recognize the palace from the 5th series of Game of Thrones. Boasting amazing architecture and stunning gardens. you could easily spend a whole afternoon here. The most mesmerizing part of the palace is the history, and the building itself tells the dramatic tale of the Moorish Dynasty to the Christian rule. Each chapter of this story is represented throughout the rounds. Plaza de Espana is about a 15 minute walk from Sevilla Centro inside Maria Luisa park. If you would rather not walk, there are bike rental stations all over the city, as well has plenty of horse drawn carriages that will take you to the plaza. 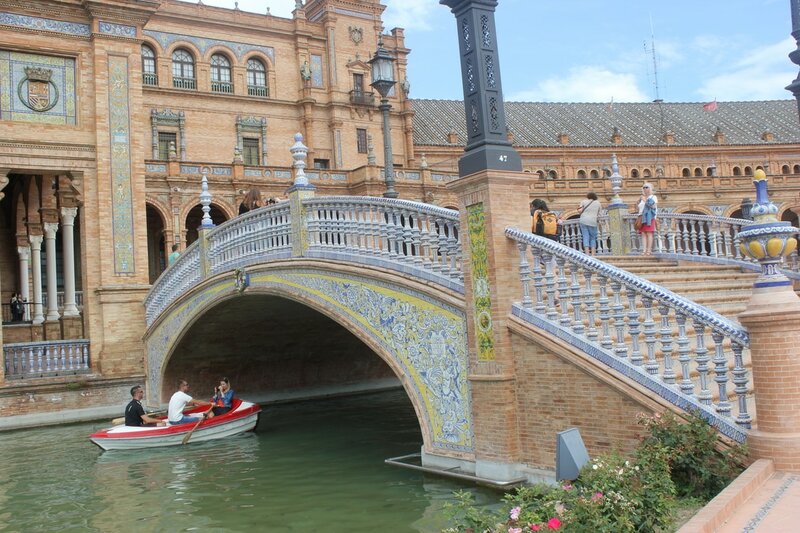 It is a Renaissance Neo-Moorish building with decorative foot bridges and a canal which allows boat rides. 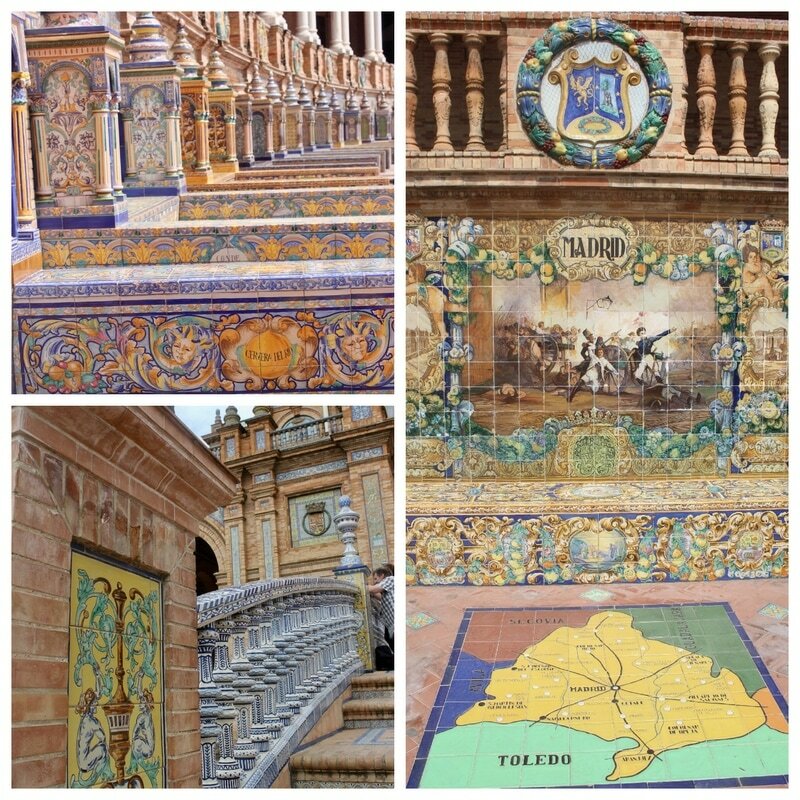 The complex is decorated with azulejos, painted ceramic tiles that are popular in Seville and can be found all across the city. Colorful tiles are found throughout the building. Decorative benches are found along the front of the building. Each depicts a different province in Spain. There are 58 benches in total. Otherwise known as the "mushrooms", boasts the world's largest wooden structure. Locals are not too pleased with this new structure, as they consider it an eye sore. But for tourists, it is a great value and a unique way to see the city from a different perspective. The structure was built where a market was previously located in La Encarnacion square when the area was being modernized. The market was torn down, and the area was unused until 1990, when Seville chose to construct an underground parking space. During this time, the ancient Roman and Moorish ruins were discovered, and construction was frozen. You are free to visit the ruins when purchasing tickets for the Metropol Parasol. This is one of the best values in Seville. It is open most of the day, and is very inexpensive considering admission comes with a choice of beverage. Water, beer, or wine. ​Triana is located on the left side of the Guadalquivir River. It is connected to the city by the famous bridge, Isabel II. This Bridge once was filled with locks representing love, but they have been removed. Triana is filled with culture and character. It was one known for it's Gypsies but is know famous for it's Flamenco culture. 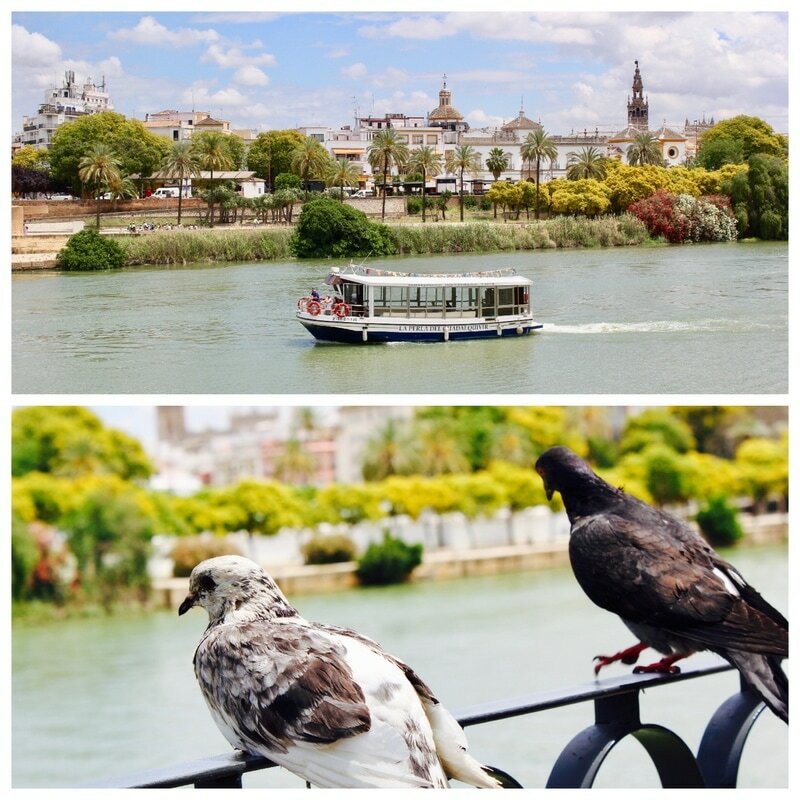 In my opinion, Triana is one of the best places to enjoy Sevilla like the locals do. You can find great food at Los Golandrinas. It gets very busy on weekends and seating is limited. It is recommended to eat standing at the bar. Los Golndrinas became so popular they opened a second location. Los Golandrinas 2.
will be right in the middle of the action with spontaneous outburst of dancing, big crowds, and passionate singing. Casa Anselma is a very busy spot, but a bit tricky. There is no sign on the door, only tiles. Casa Anselma is very close by both Las Golondrinas locations. In Spain, dinner is around 8:30 pm. If you time it right, you will be just in time for Casa Anselma. ​ sure you are purchasing drinks from the bar. Seville is a vibrant and expressive city that should not be missed. It hosts some of the best food, sites, and entertainment in all of Spain. There is something about the food in Disneyworld that makes you go mmm . . . Everything tastes better on a Disney vacation. ​Here is my attempt at a "Top 10 Disneyworld Snacks" list. This is super hard to do because there are so many I love. I will probably change my mind as soon as this is written. Please keep in my that this is MY Top 10. There are many snack that did not make my list but are up there in the deliciousness rating. Please comment and share your top snacks! This can be found at Sunshine Seasons in EPCOT's Land Pavillion. 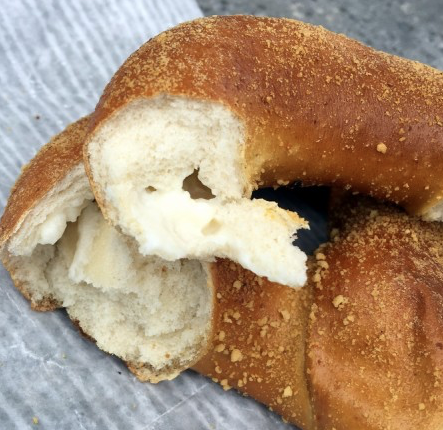 This is a great breakfast snack for your early mornings at EPCOT and is a good use of a snack credit. It is not too sweet, but has a subtle, buttery flavor paired with the berry and cinnamon. It is very moist as you would expect from a bread pudding, without being weighed down and soggy. This can be found at​ Mahindi in Disney’s Animal Kingdom which is a food cart just outside of Tusker House. If you love the Jungle Juice served at Tusker House, you will love this slushy version.
. . . great anytime of day and it is super refreshing. It is a mix of Passion Fruit, Orange, and Guava juices. It is also served at 'Ohana's Best Friends Breakfast, but it is called Liliko'i Juice. Found at 50's Prime Time in Hollywood Studios. You do not have to dine in to order the milkshake. This is a very popular item to order for take out -- perfect for two! Found in Magic Kingdom at The Lunching Pad in Tomorrowland. These are ridiculous. I could eat 3 at once. These tasty treats are also available on the Disney Cruise ships. The Yorkshire County Fish Shop in the UK Pavillion in EPCOT offer fish and chips. Yes this is a great snack. It is very busy here so the fish is very fresh and always nice and hot. It is cooked perfectly. Exactly what you want when you order fish and chips. There isn't really much seating, if any, so this is a great treat to walk with or sit on a curb. And the price is a big higher than your average snack, but cheaper than a meal. You get two pieces of fish and some "chips" at about $10. . . . great shareable snack item. 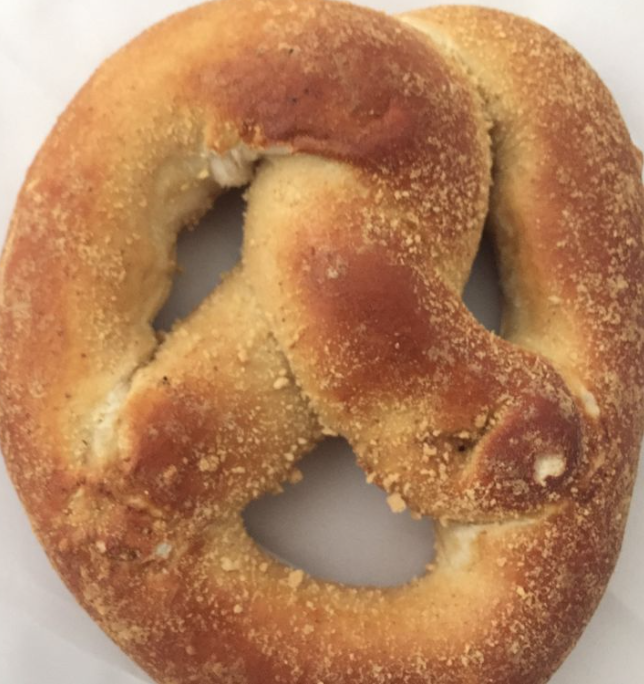 This can be found in the Norway Pavillion in EPCOT at the Kringla Bakery Go Cafe. You cannot go wrong with any treat from Kringla but School Bread is a must. School bread is very unique. 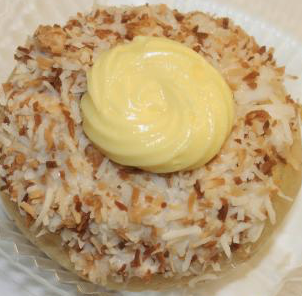 It is a sweet cardamom bun filled with a creamy custard and topped with toasted coconut and more vanilla cream. It is not an overly sweet dessert and the star is definitely the cream filling. I guess I am cheating a bit with adding these two together. They are both found at Gaston's Tavern in Fantasyland at Magic Kingdom. If you are lucky, you might even see Gaston at the Tavern. ​Despite the word "brew" the drink is alcohol free. It is a sugar-free frozen apple juice with a marshmallow flavored foam on top -- pretty refreshing for a hot day at the park. The cinnamon bun is massive and can easily be shared by two or three people. This will not come as a shock to anyone. The Dole Whip Float is the perfect snack. It can be found at Aloha Isle at Magic Kingdom. My problem with this location is that it is only available with pineapple soft serve. This is good and I would settle if I had to, but the best Dole Whip Float is at the Polynesian Resort, Pineapple Lanai. Here you can choose either pineapple, vanilla, or pineapple-vanilla swirl for your float. In my opinion, the way to go is vanilla. This is the perfect combination. ​Since the Polynesian Resort is a quick stop from Magic Kingdom on the Monorail, it is never too far to stop there and get a vanilla Dole Whip float on your way to the park. You can also get this at Animal Kingdom with Rum at Tamu Tamu refreshments, and sometimes at EPCOT. The picture below is a pineapple float from Aloha Isle. ​Once she discovered she could get one in each park, she did! I must say it is truly yummy. The hard chocolate on the outside is dark and rich, and the ice cream is perfectly creamy and full of flavor. Of course, it is shaped like Mickey which makes it taste even better! There is also a Mickey shaped ice cream sandwich with cookies and cream ice cream. ​The cronut is available at the Refreshment Port in Epcot's Canada Pavillion. I not a huge fan of donuts or sugary cinnamon mixes, but this snack not only made my Top 10, it made my #1! It is a cross between a donut and a croissant -- served warm. The inside is flaky perfection. The cronut is big enough to share, but you would regret it. Get your own. Do not miss the cronut! Ahoy! Like everything Disney does, t'is all in the details, and thar is no shortage of this for the Cruise Line's Pirate Night. 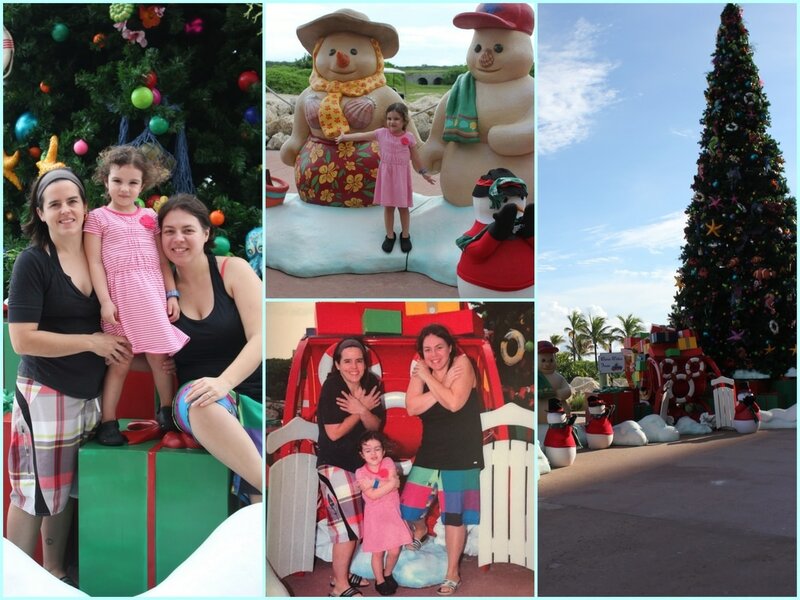 The entire day is filled with Pirate themed entertainment including the wee one's club, dining, pirate photo ops and characters dressed as buccaneers. Pirate night happens on most, but not every Disney Cruise. Wee ones of all ages (that means parents also!) are encouraged to participate. Many clans bring costumes and dress up for the event. Don't worry if ye forget yer costume, because Disney provides all guests with a bandana to wear. Not only is it functional, but t'is also a wonderful and FREE souvenir to take home with ye. Bibbidi Bobbidi Boutique offers pirate makeovers as well, that include beards (or lip gloss), make up, eye shadow, and maybe even a scar or two. This be be something ye pre-book. Thee packages range anywhere from $45-$100. 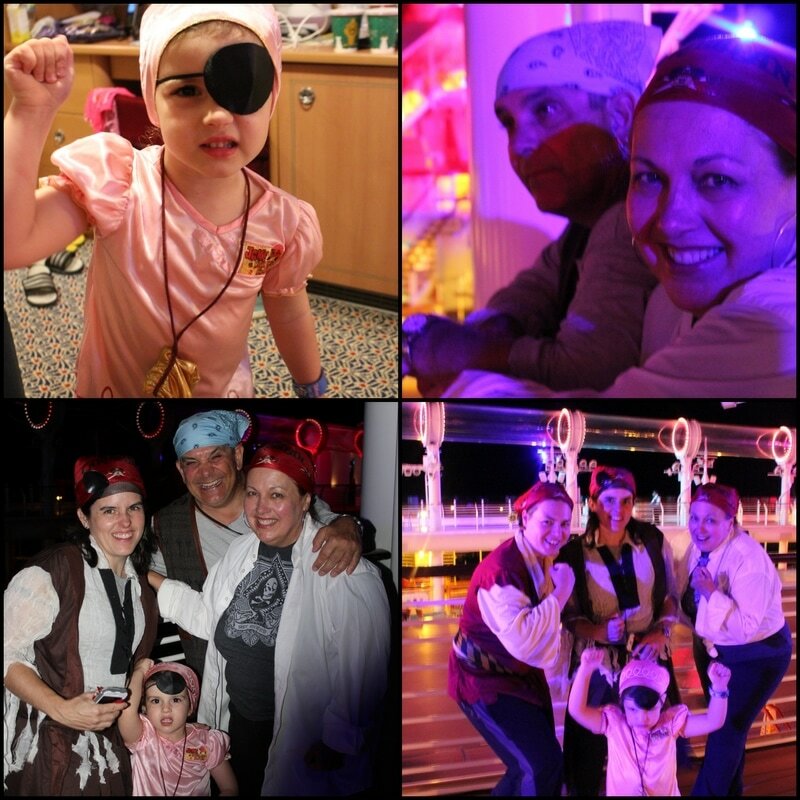 Here be some pictures of me mateys enjoying Pirate Night! Alas! Here are some pictures of a few pirates on thee galleon (the boat) that we met. Pirate Stitch and of course Jake! Arrr! 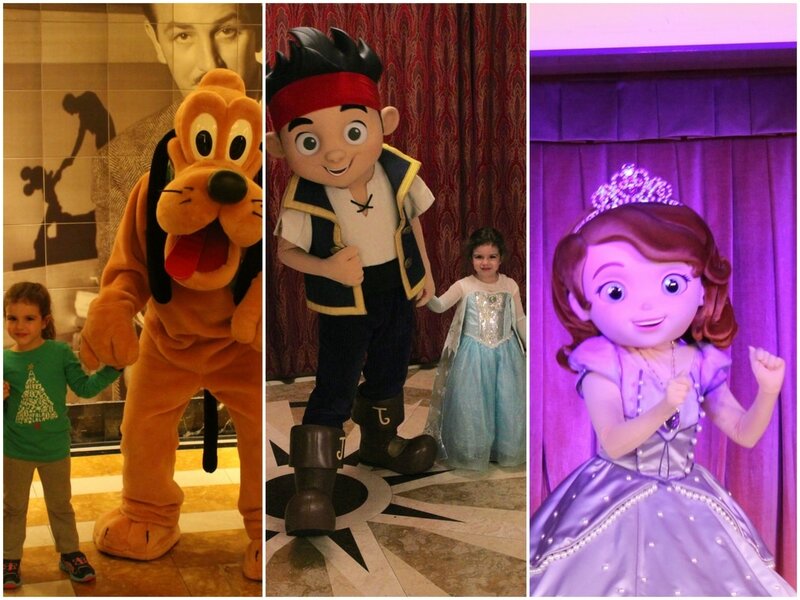 Ye could also meet Peter Pan, Cap'n Jack Sparrow, Cap'n Hook and Mr. Smee, but we didn't get a chance to meet them. This is on my must do list for our next Pirate Night. At dinnertime, all of the restaurants had the same pirate themed menus that looked like treasure maps. The menu items all had catchy menu names like, "Castaway Chicken Breast" or "Sunken Vegetable Treasure." I cannot offer a review of this menu because the adults in my clan dined at Palo this night, and my daughter dined in thee Wee one Club. Arrr! The show begins after the second dinner seating so you have plenty of time to head back to your stateroom to begin your transformation into a buccaneer. After a long day for the kiddos, some rest time prior to the party might be a good idea. Try to arrive a little bit early because pretty much everyone on thee galleon (the ship) will be at thee party. This way you can get a good spot. We chose to be on the balcony, which was one deck above the party, and our view was unobstructed. Arrr! The show is jam packed with action. 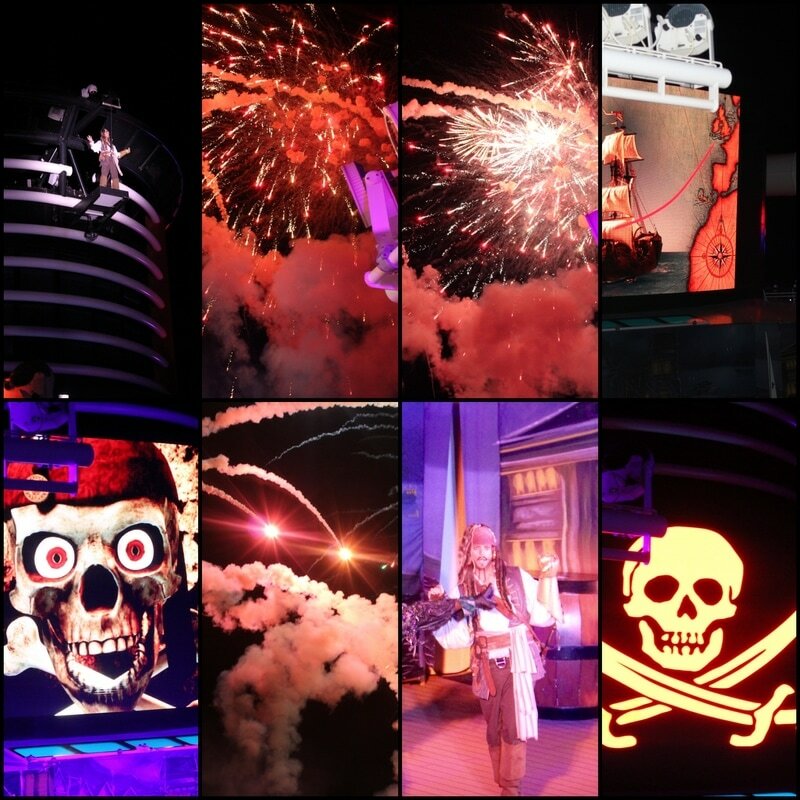 Cap'n Jack Sparrow performs a stage show, and the highlight of the night are fireworks at sea! Can you image being out in the open waters of the Caribbean, and watching a private fireworks show? Truly breathtaking. After the fireworks, there is a dance party. I am not sure how late the dance party goes because we headed back to our room with our tired little one right after the fireworks show. "Meet and greets" start as soon as you enter the ship and continue throughout. 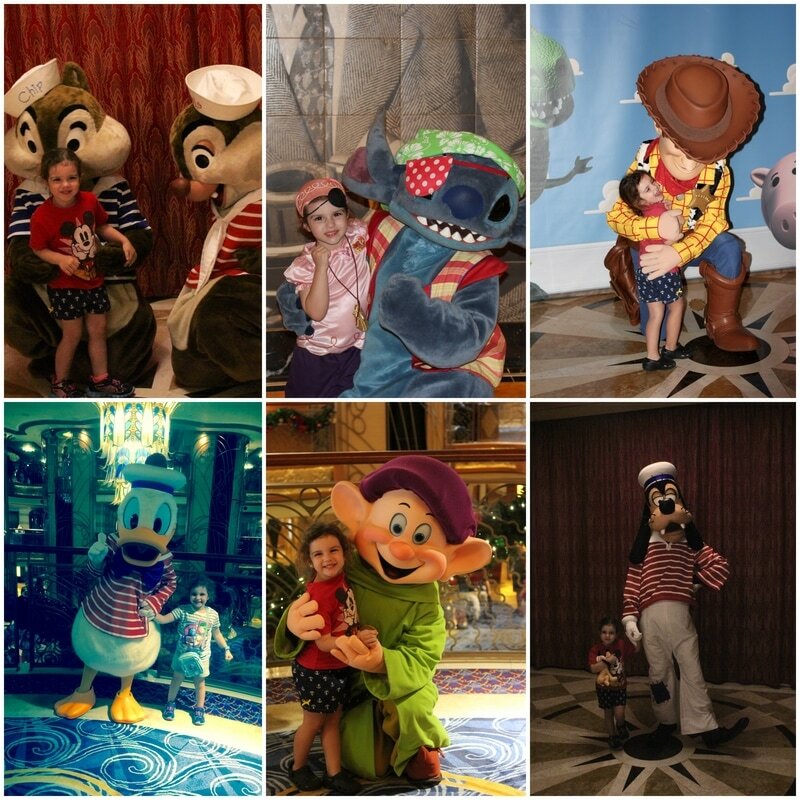 As compared to one of the Disney theme parks, the cruise lines makes it very easy to see lots of characters. Most of the meet and greets involve standing in line, but the lines move fast and weren't an issue. Some of the meet and greets require tickes -- they are free and first come, first serve. I recommend that you get your tickets as soon as you board. Your daily navigator, which you receive day one at check-in, includes information about where to get tickets. 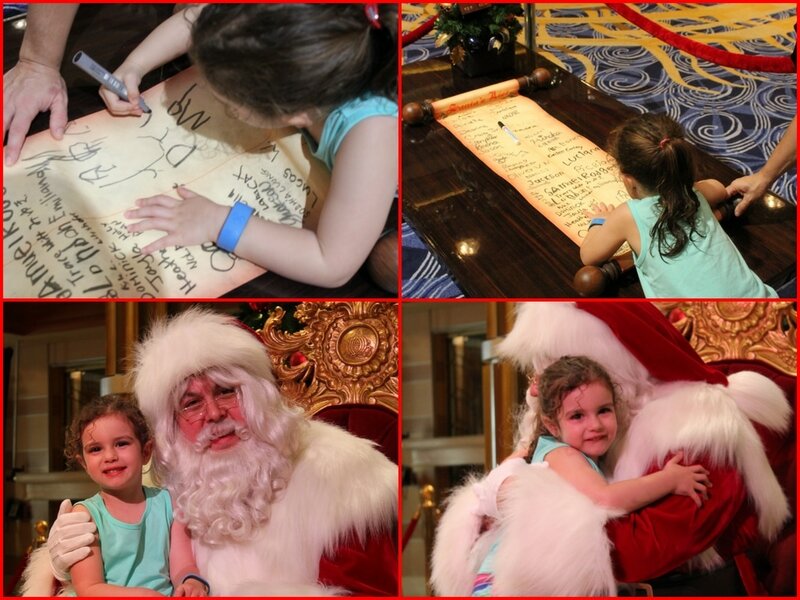 The two princess meet and greets (Anna & Elsa, and a group Princesses event) were the only two that required tickets on our cruise. We were able to get both tickets at the same place, same time. 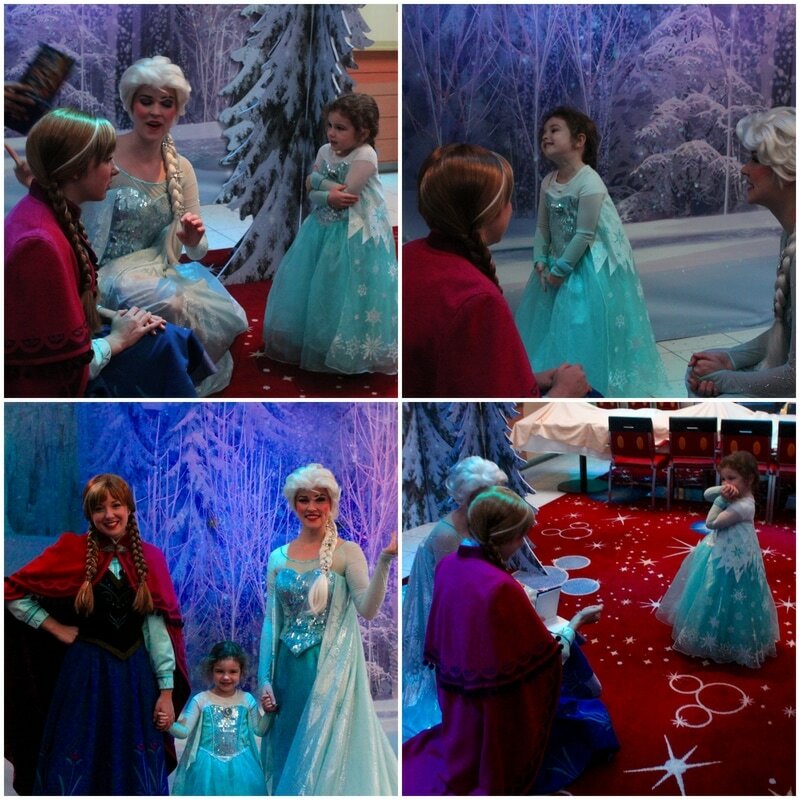 Without the tickets, we would have missed these two very popular meet and greets..
Meeting Anna and Elsa on the ship is an amazing experience -- and the line is much quicker than meeting them at the parks. They met at the Animator's Palate where TV screens were showing scenes of Arendale -- too fun! The Animator's Palate restaurant is off the beaten track, unlike the meet and greets in the Atrium -- and less likely to be turning away disappointed children without tickets. 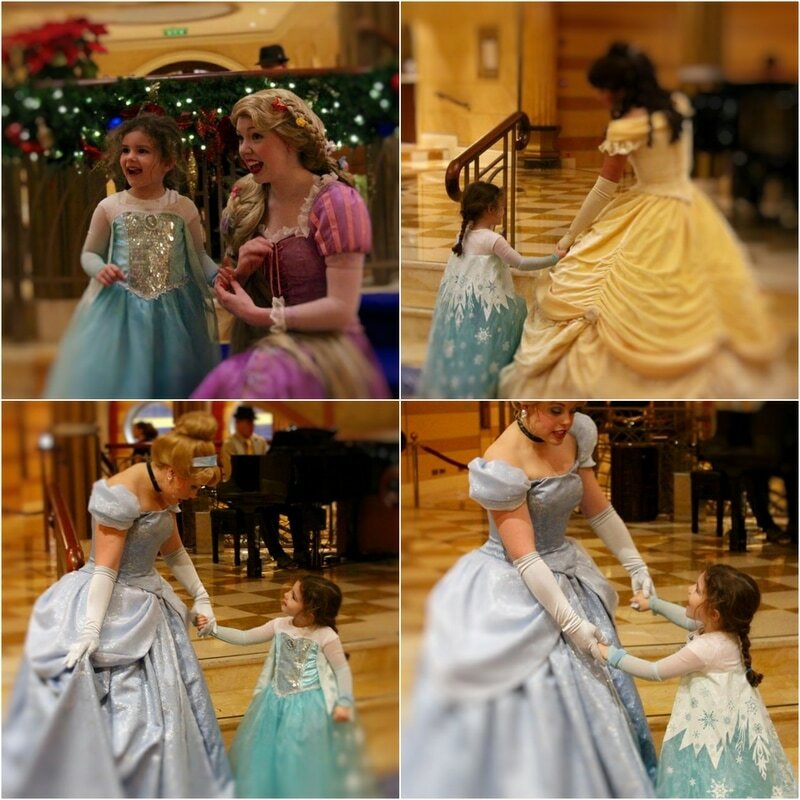 The meet and greet for Anna & Elsa is a must! Sure, an autograph and a picture is requiste, but interacting with the characters creates an experience your child will always remember. 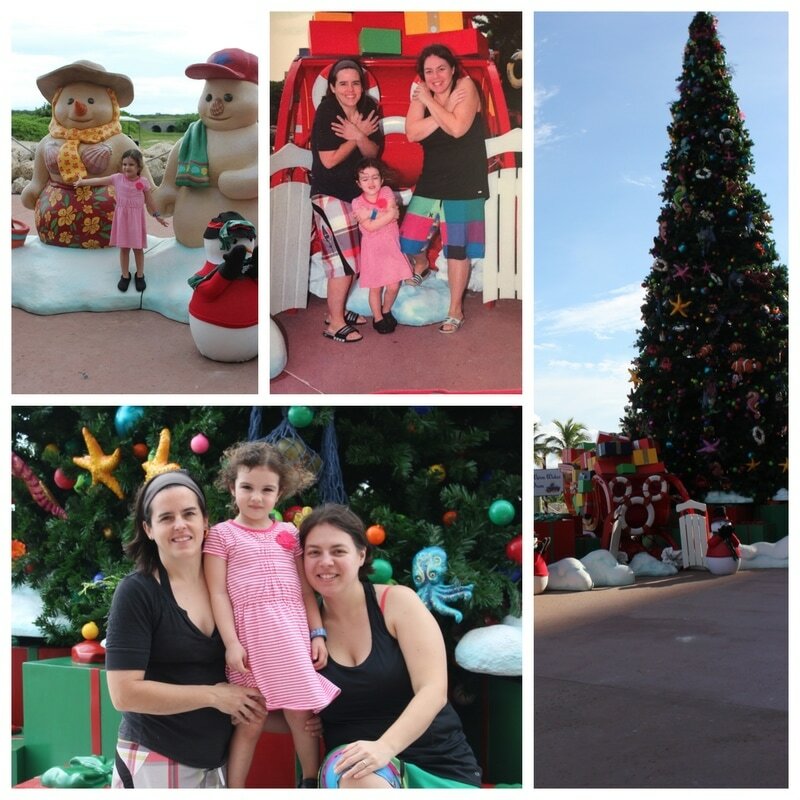 As you can see in the photos below, my daughter said she was freezing in Arendale! She also told the sisters a joke. "Why can't you give Queen Elsa a balloon? Because she will Let it Go!" Anna and Elsa loved the joke and told her they couldn't wait to tell the joke to Olaf! Schedules for character appearances are posted throughout the ship, on the daily navigators and on the Disney Cruise Line app. They generally meet for 15 minutes. When the 15 minutes is up, a cast member will stand at the end of the line. At that point, if you get behind the cast member, you will be in line for the next scheduled character meet and greet. It is a good idea to get there about 10 minutes early for the character you want to meet. As you can see, we saw quite a few characters (not all of them) and it really didn't take up too much of our time. The characters we did not see were Peter Pan, Captain Jack Sparrow, Captain Hook and Smitty. And of course Mickey and Minnie in their many costumes. We loved the holiday sweaters and formal wear. Oh yeah and Santa was there! Interact with the characters for a really great experience. Ask Belle what her favorite book is, or tell Pluto he is a "good dog" and give him a pat on the back. The characters will play along and, as you would expect, they always stay in character. You can tell they love what they do. -- it helps makes the experience more efficient. "Let it go, let it go!" Have fun and enjoy the meet and greet experience. 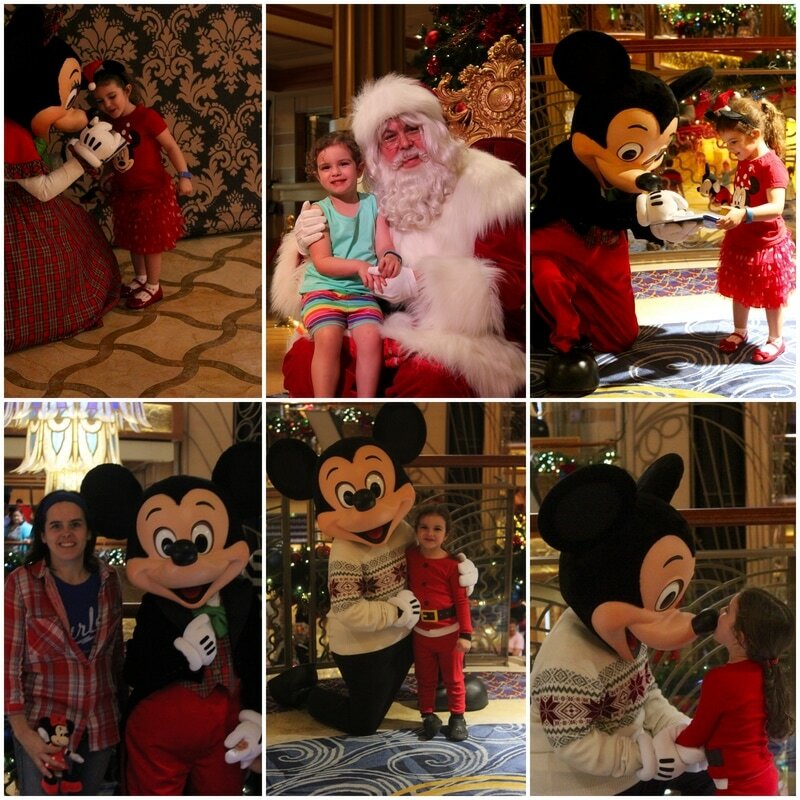 Our first sailing with the Disney Cruise line was for the Very Merrytime Cruise on the Disney Dream. 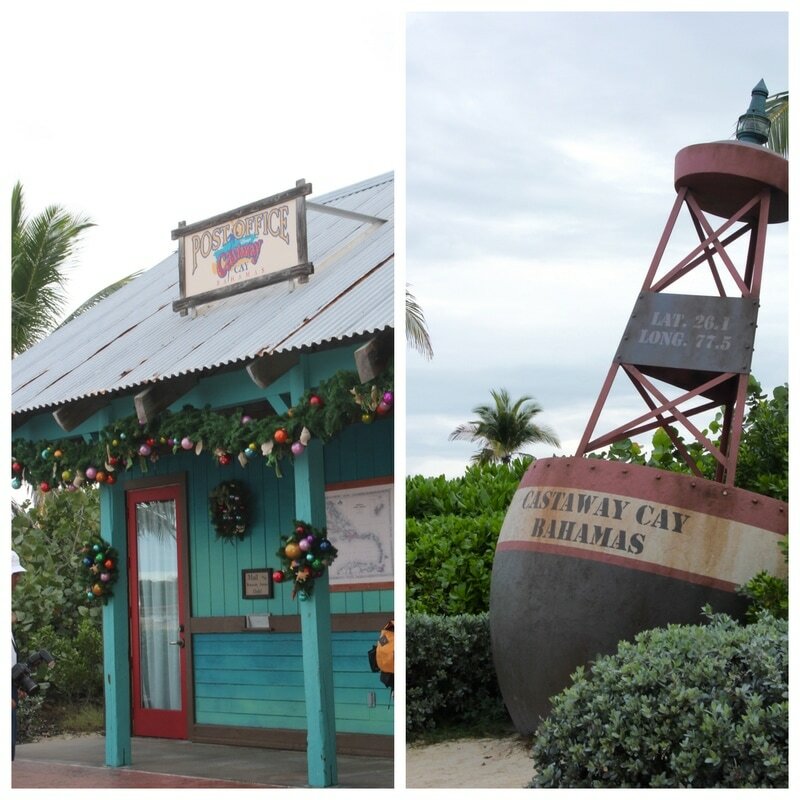 We chose a 4-night cruise with stops in Nassau and Castaway Cay (pronounced: key). 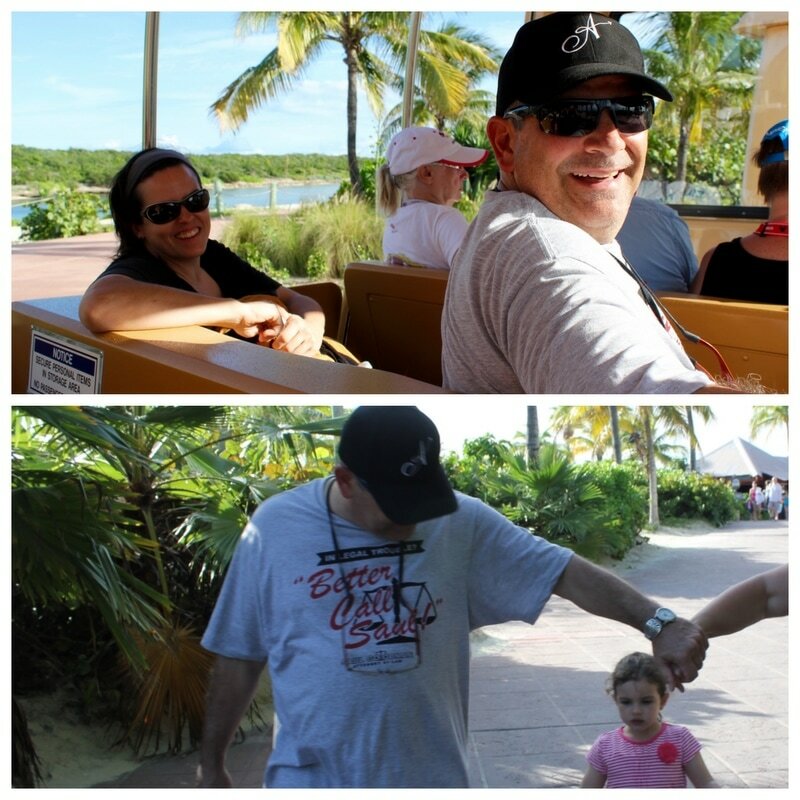 We flew, the day before the cruise, from Boston to Orlando and stayed at the Hyatt Regency located inside the airport. Since we were traveling with a small child and concerned about the possibility of inclement weather in Boston, this extra day was worth the expense. It helped keep the stress down, no worries of delayed flights, and jump-started our vacation. The hotel was great and the rooms had balconies that looked down into the airport terminal. 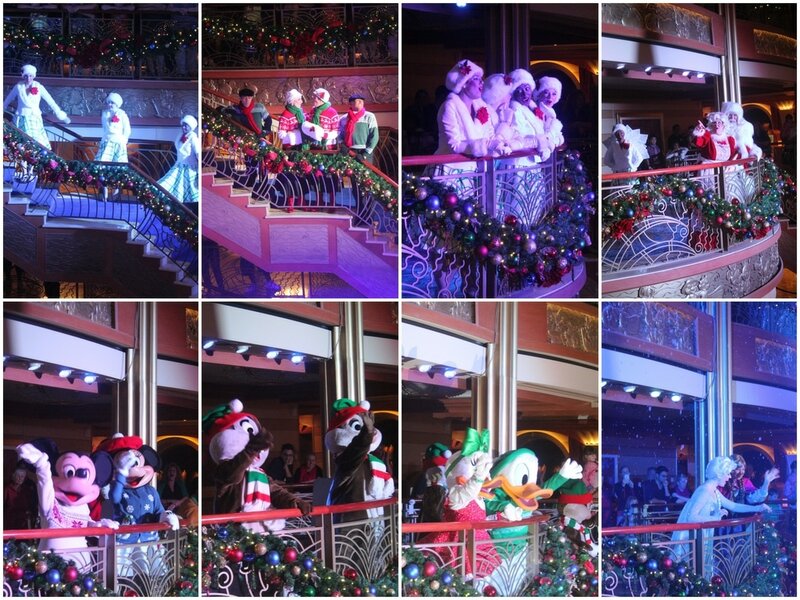 Inside the cruise terminal there are characters doing meet and greets! (The lines are really long for the characters so a better option would be to wait until you get inside.) There is also a model replica of one of the ships which is really neat. It is extremely detailed. As soon as you enter the ship there are plenty of photo ops. 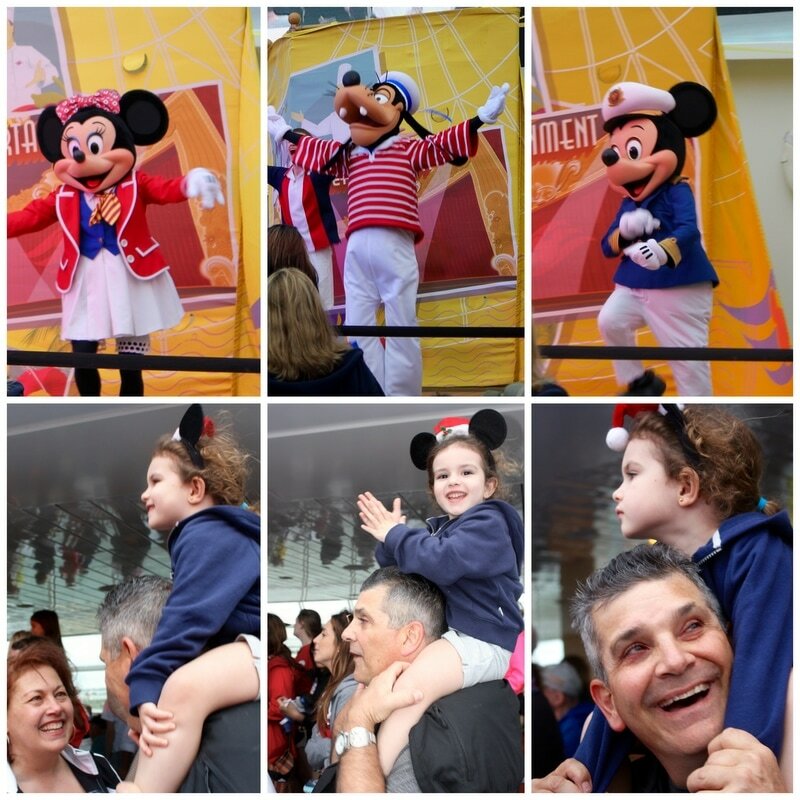 The coolest part of entering the ship is the cast members announce the entrance of your family by name! "Welcome aboard, the Lucci family!" Talk about feeling special. This definitely set the mood for a fun trip. 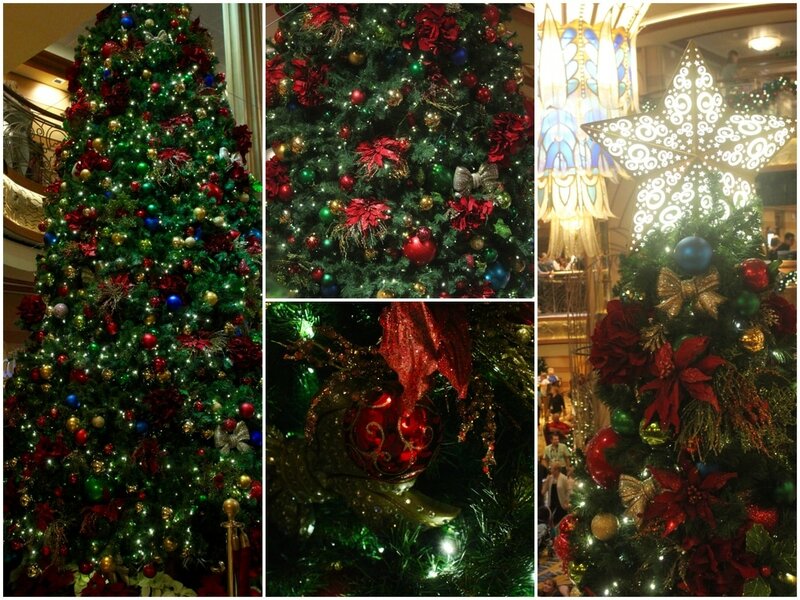 The festive Sail Away party begins before you set sail. 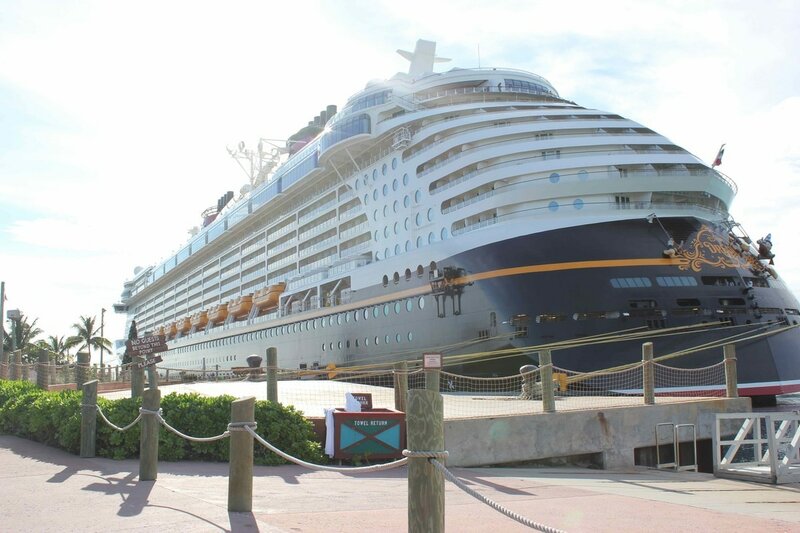 Some say it is the official start of the Disney Dream experience. If it rains, the Sail Away party moves to the Atrium. We had light rain but, happily, they kept the Sail Away party outside. 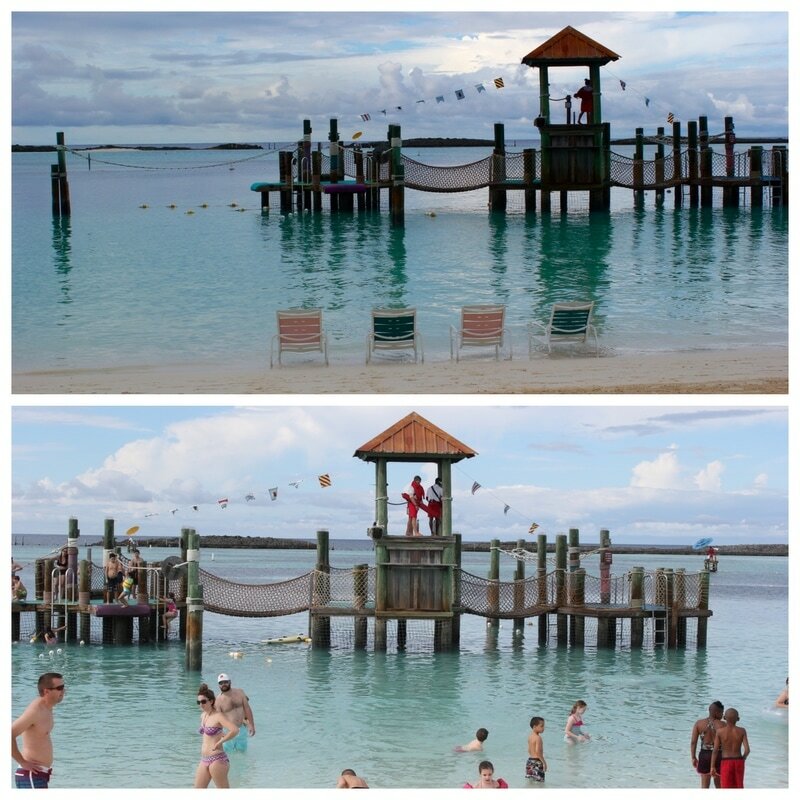 Here are some pictures from the Sail Away party. Can you tell my family was feeling the magic? 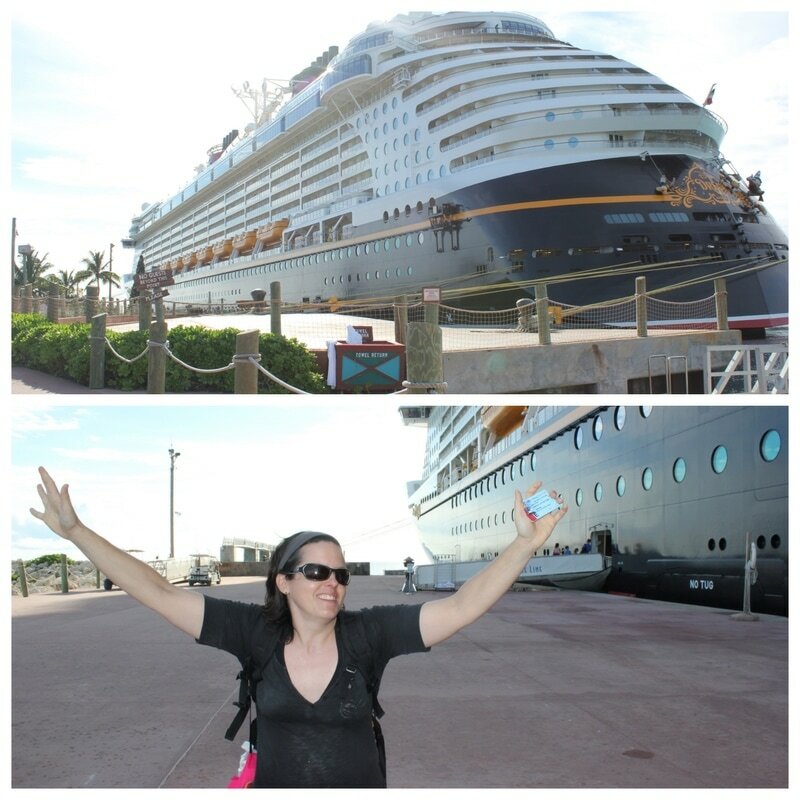 One thing I loved about cruising on the Disney Dream was the ship's horn, which is first heard during the Sail Away party to announce our send off. Disney uses familiar melodies such as "A Dream is a Wish Your Heart Makes" and "When You Wish Upon a Star" -- if you can, imagine that sound in the form of a mighty ship's horn. In the world of Disney, it really is "all about the details." ​Another cool detail you will notice is that the ship uses colors inspired by Mickey Mouse like the yellow lifeboats. Disney had to get special permission from the U.S. Coast Guard to substitute the regulation orange with the Disney yellow. The yellow lifeboats represent Mickey's boots! Be sure to pack a day bag as you will not have immediate access to your room and luggage. We boarded by 12:30, our stateroom was ready around 4 pm, and our luggage arrived about an hour later. The day bag allowed us to enjoy the festivites that start as soon as you board. 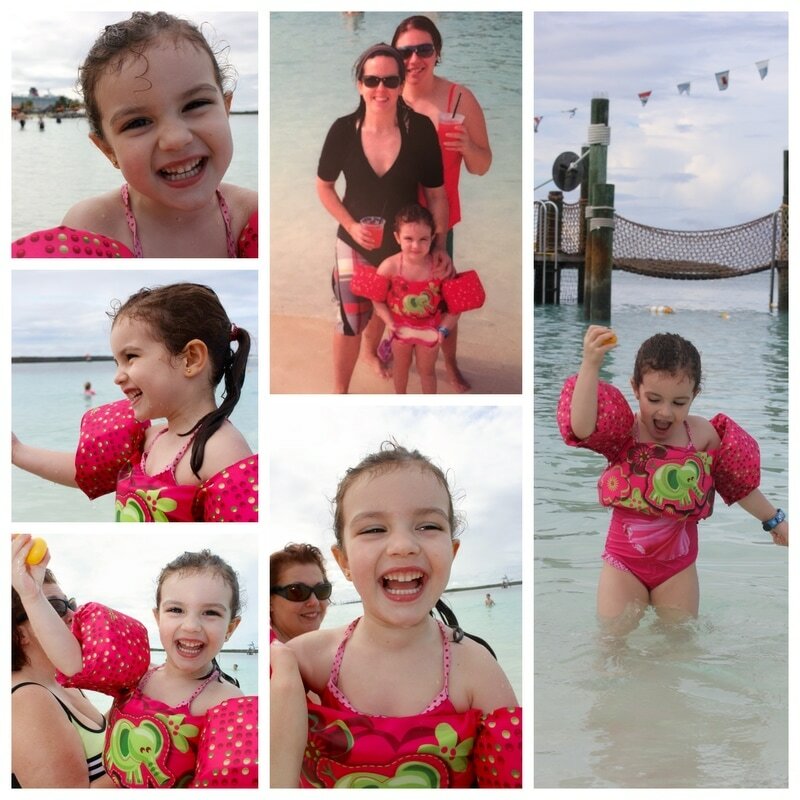 We wanted to take advantage of the onboard pool -- so our day bag was packed with swimsuits, sunblock, and a change of clothes. My family of three had an inside stateroom. Despite being one of the smallest categories (11A), we felt cozy and comfortable. Every room includes a bathtub which is unique for cruise lines and another example of how since Disney caters to families. Our stateroom was on Deck 9, and in the middle of the ship -- conveniently located by the elevators and staircase. We never had to walk down a hallway to get to our room, and it was surprisingly quiet. I would highly recommend this part of the ship. Try to get a room on the highest floor possible. In general, you will feel less motion and, in our case on Deck 9, we were just two flights up to the pool on Deck 11. Elevators can get backed up on cruise ships. It's great to have quick access to the stairs. There are 3 categories of inside staterooms: 11A ( Deck 8, 9, 10), 11B (Deck 5, 6, 7), and 11C (Deck 2). Our stateroom category sleeps 4 and is 169 square feet. It is furnished with a queen size bed (comfy! ), a convertible sofa, and an upper pull-down bed (unique to some of the staterooms that sleep 3-4) . Our daughter loved her pull-down bed and decorated ceiling -- Peter Pan and Wendy flying through the night sky. Another exciting feature of inside staterooms are the Disney "virtual portholes." A camera mounted outside the ship is connected to a live feed straight to your virtual porthole. If you keep your eyes peeled, you may see a Disney character zoom by! We had family join us for the cruise from Santa Fe and they were able to get a room right across the hall from us. 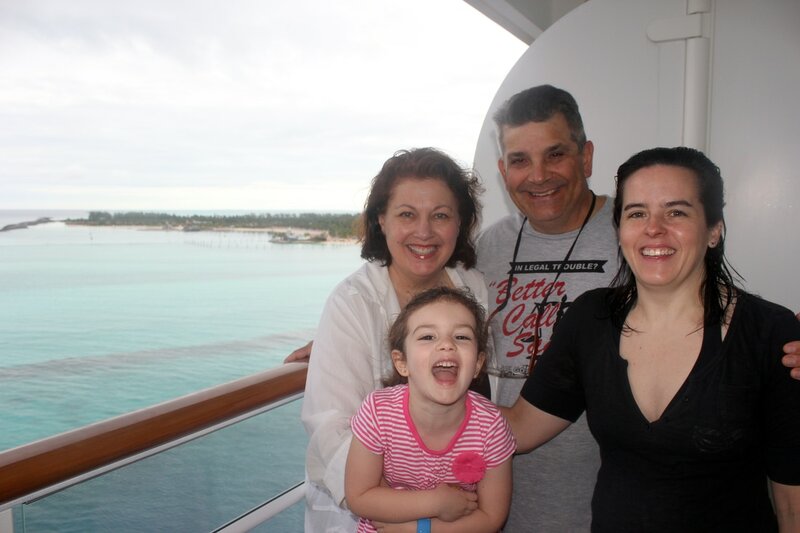 They had a veranda stateroom, so we were able to visit and take advantage of the great views!